Aero Espresso Italiana S.A., experimental period, Athens to Brindisi, clear 'Brindisi/3.11.26/Posta Aerea' arrival ds on front, Drossos corner card franked 2l 1926 air and 60l ordinary canc black Athens cds. Small non invasive semi circular filing hole rh edge. Aero Espresso Italiana Vignette, Brindisi -Athens-Constantinople, c1926, mnh. 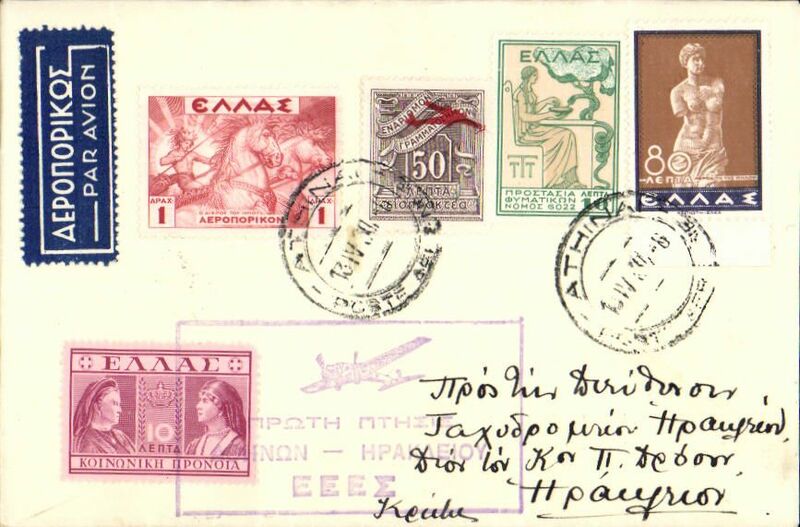 Also example on cover from Greece to Florence posted July 25, 1926. Written up and beautifully displayed on album leaf.See scan. 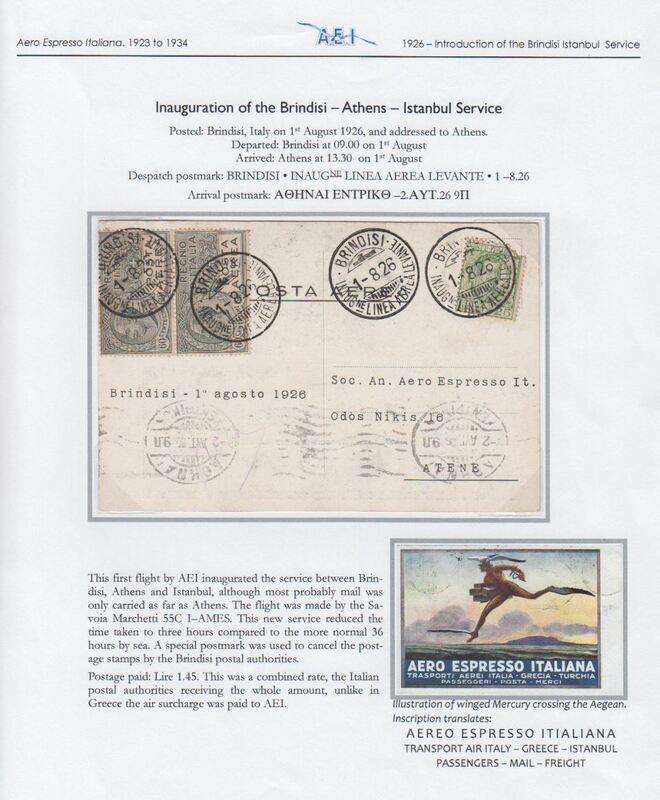 F/F Aero Espresso Italiana Brindisi-Athens-Istanbul service, airmail cover franked 1L45 canc Brindisi cds, athens 2/8 arrival cds on front, written up and displayed on album page.also including attractive multicoloured AEI 'winged Mercury' advertising label. See scan. Aero Espresso Italiana, Brindisi-Athens-Constantinople service, interim design 3d, 5d, 10d semi official stamps printed on white and on yellow paper (8 stamps), prepared but not issued, umm. Written up and displayed on album leaf.See scan. 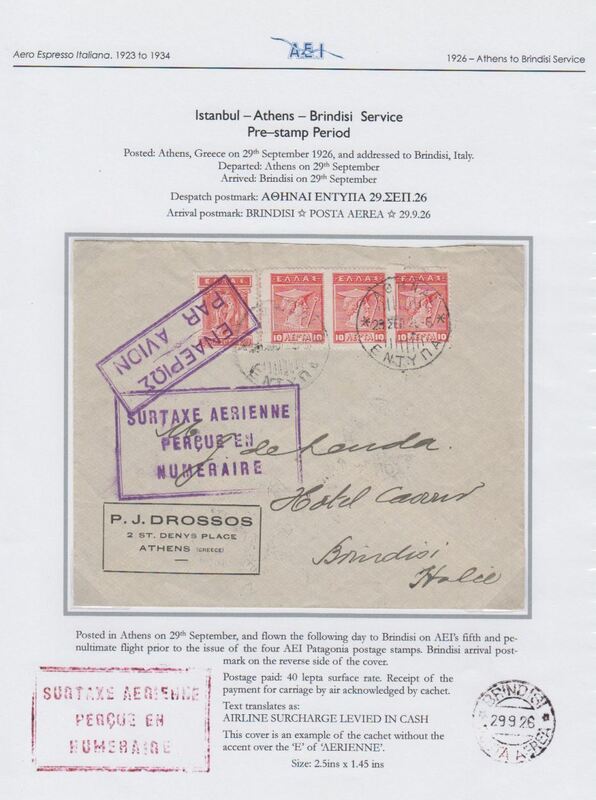 Aero Espresso Italiana S.A., experimental period, Athens to Brindisi flight without special airmail stamps, but with the large rubber framed "Surtaxe Aerienne/Percue En/Numeraire" in violet (used only between 4th Aug and 12th Nov, 1926), clear 'Brindisi/29.9.26/Posta Aerea' arrival ds verso, Drossos corner cover franked 1911 10 x3, 30l, canc '……/Entyma/28 Sep 28'. The year on the postmark is a clerical error. 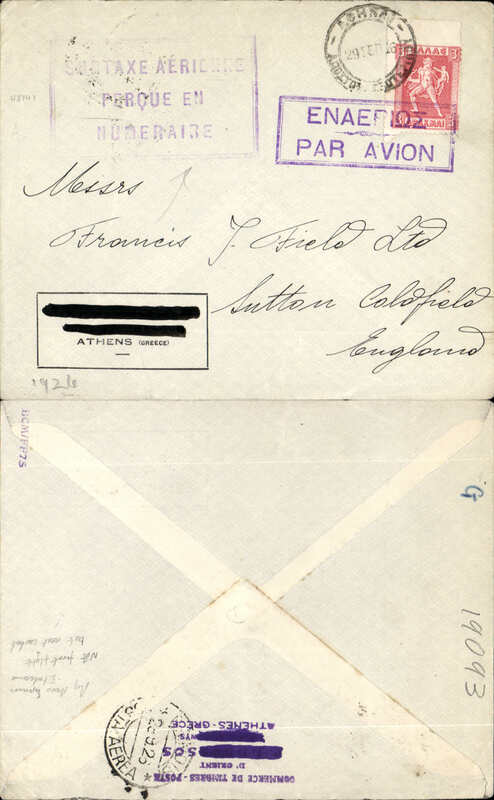 The surtax hand stamp, and the date of arrival back stamp, confirm that this cover was flown in 1926 during the experimental period which lasted from 1st Aug until 31st Dec.
Aero Espresso Italiana S.A., experimental period, Athens to Brindisi flight, 'Brindisi/29.9.26/Posta Aerea' arrival ds verso, and on to England, Drossos cover addressed to Francis Field, franked 3d ordinary, no special airmail stamps, but with the large rubber framed "Surtaxe Aerienne/Percue En/Numeraire" in violet (used only between 4th Aug and 12th Nov, 1926), also violet boxed 'Enaipios Par Avion' hs. 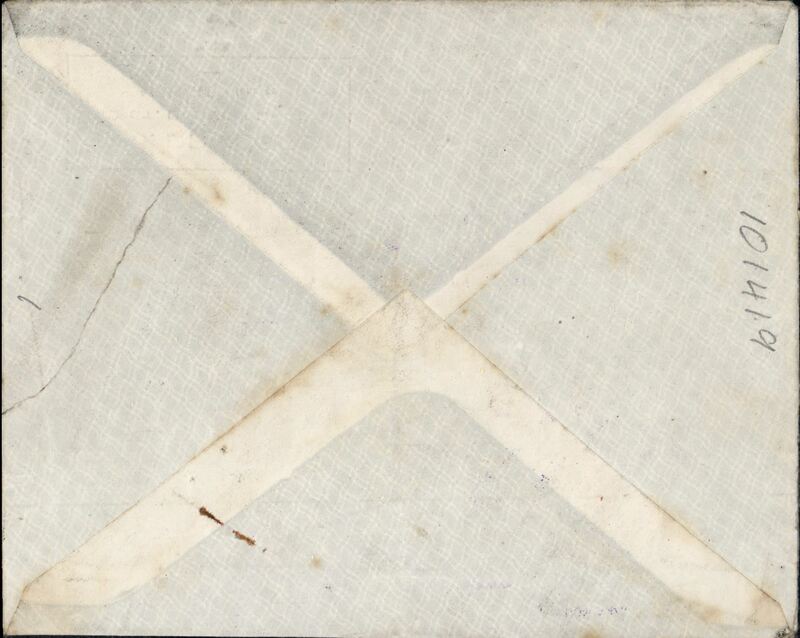 The surtax hand stamp, and the date of arrival back stamp, confirm that this cover was flown in 1926 during the experimental period which lasted from 1st Aug until 31st Dec. Francis Field authentication hand stamp verso. 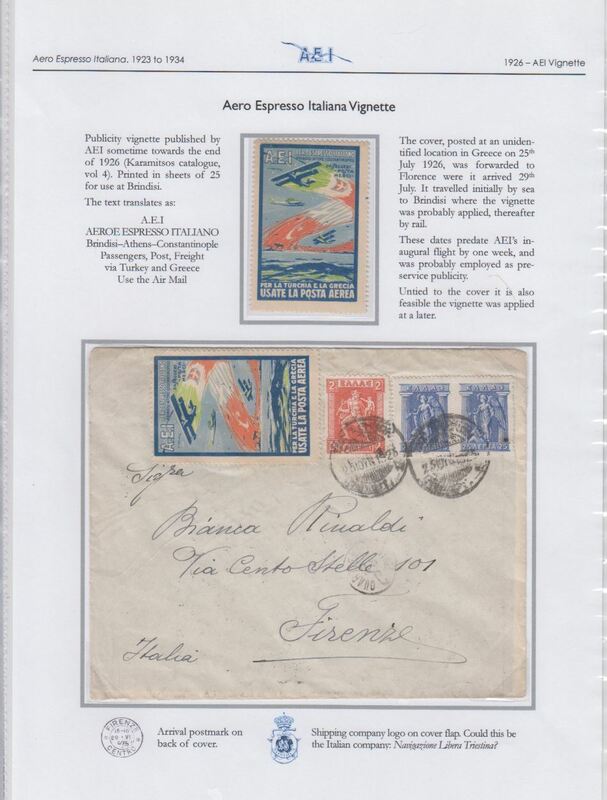 Aero Espresso Italiana S.A. pre-stamp period, Athens to Brindisi flight, 'Brindisi/29.9.26/Posta Aerea' arrival ds verso, Drossos cover, franked 40 lepta ordinary, no special airmail stamps, but with fine strike large rubber framed "Surtaxe Aerienne/Percue En/Numeraire" in violet (used only between 4th Aug and 12th Nov, 1926), also violet boxed 'Enaipios Par Avion' hs. 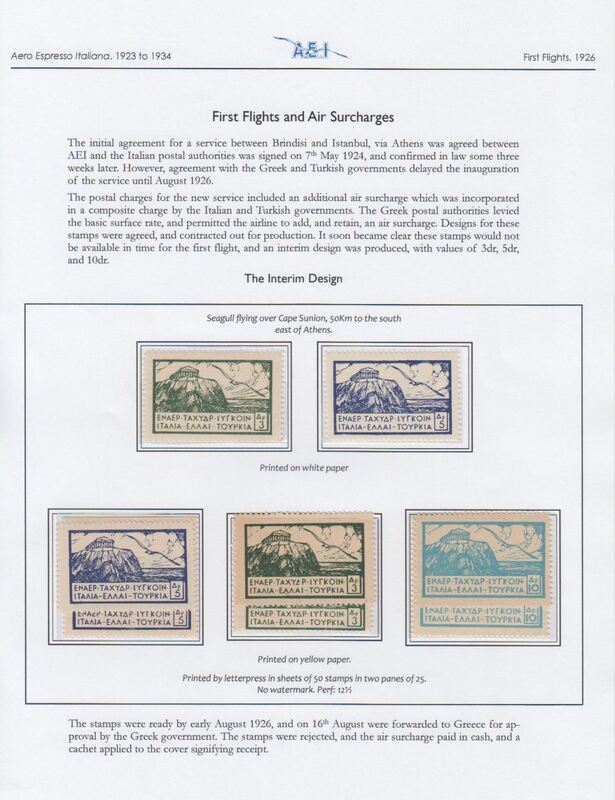 The surtax hand stamp, and the date of arrival back stamp, confirm that this cover was flown on AEI's fifth and penultimate flight prior to the issue of the four Patagonia postage stamps. Written up and displayed on album page. 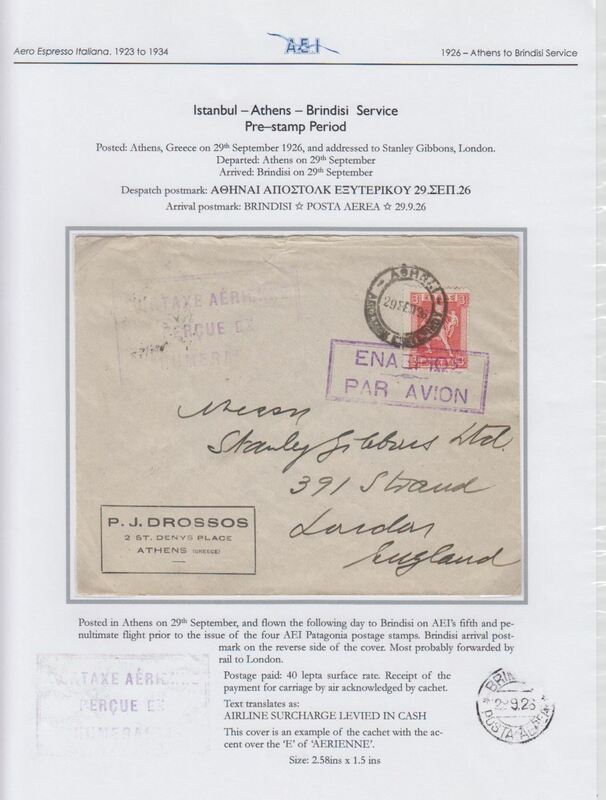 Aero Espresso Italiana S.A. pre-stamp period, addressed to London, carried on Athens to Brindisi flight, 'Brindisi/29.9.26/Posta Aerea' arrival ds verso, Drossos cover, franked 3 Dr tied by violet boxed 'Enaipios Par Avion' hs , violet strike large rubber framed "Surtaxe Aerienne/Percue En/Numeraire" hs (used only between 4th Aug and 12th Nov, 1926), The surtax hand stamp, and the date of arrival back stamp, confirm that this cover was flown on AEI's fifth and penultimate flight prior to the issue of the four Patagonia postage stamps. Written up and displayed on album page. 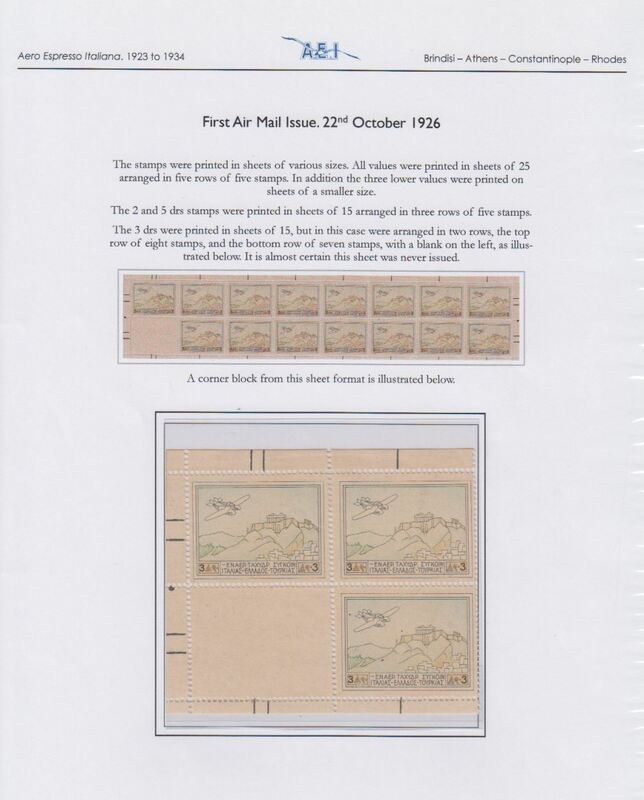 Aero Espresso Italiana, first airmail issue, 3 Dr air block of 3, umm. Written up and displayed on album leaf.See scan. 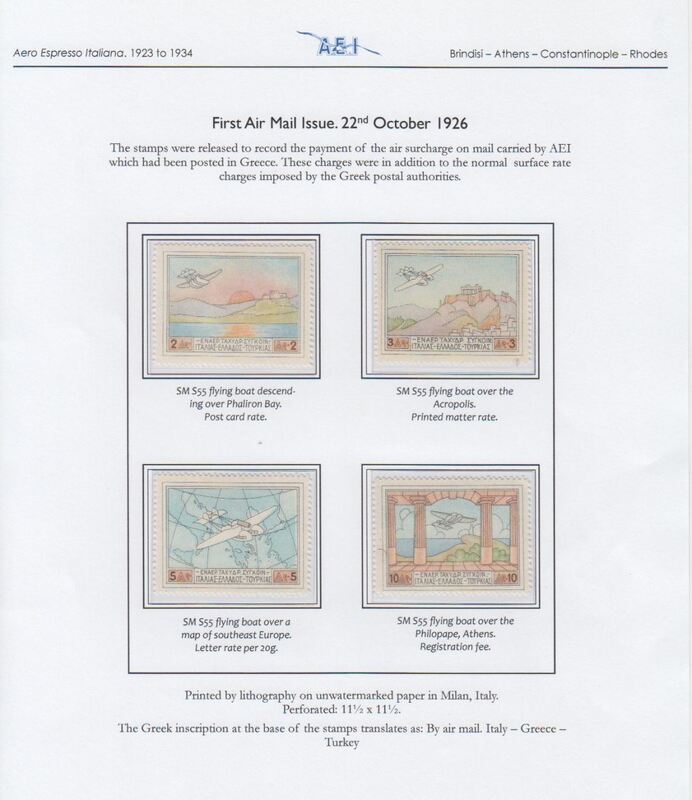 Aero Espresso Italiana, first airmail issue, set of 4, umm. Written up and displayed on album leaf.See scan. 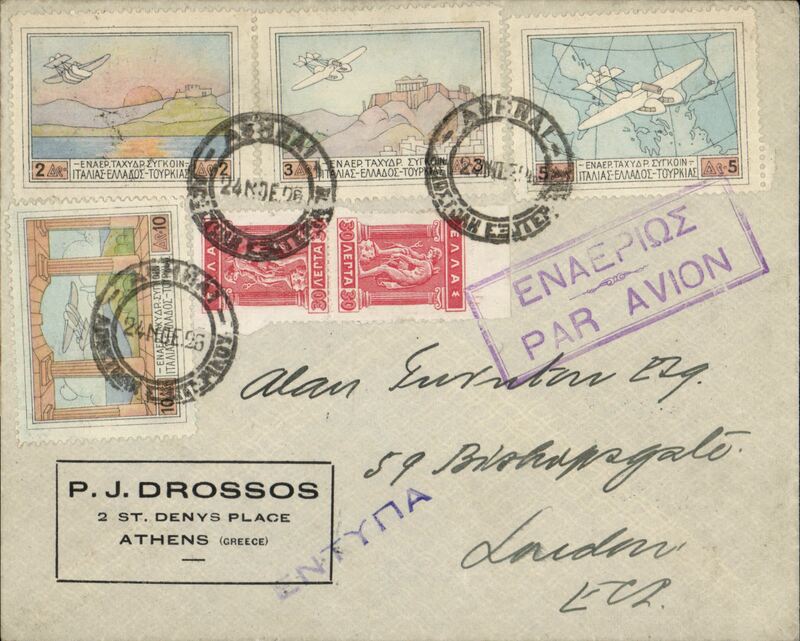 Aero Espresso Italiana S.A., experimental period, Athens to Brindisi, clear 'Brindisi/24.11.26/Posta Aerea' arrival ds verso, Drossos corner cover franking 1926 air set of 4 and 60l ordinary tied by violet framed Athens departure hs. 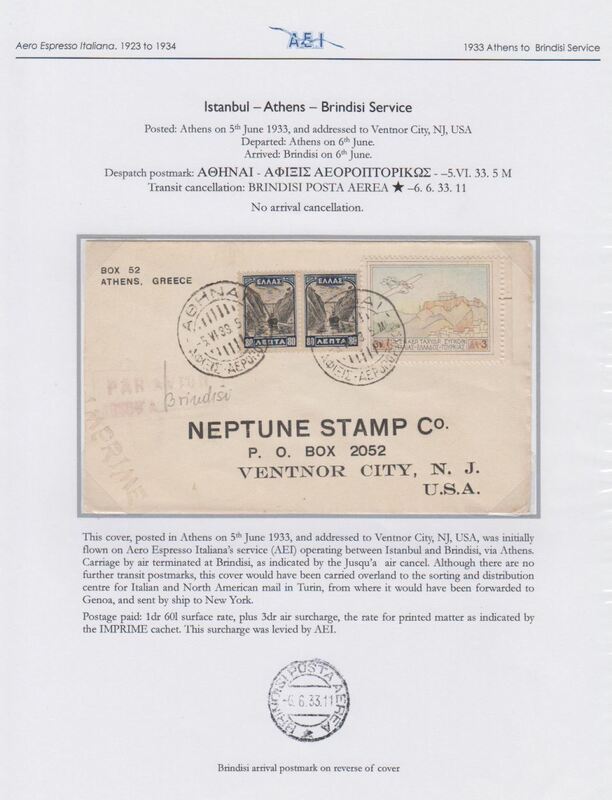 Aero Espresso Istanbul-Athens-Brindisi service, Greece to Germany bs Braunschweig 20/12, via Italy (Brindisi 16/12/26 transit), franked with first three 1926 airmail values, first year use of these airmail stamps. Red German 'Mit Luftpost be furdert Flugpostampt Braunschweig' confirms it was also flown on the later stages. Aero Espresso Italiana, Brindisi-Athens-Istanbul service, Athens to Germany, bs Konstanz 30/12, held over for Christmas, then Brindisi 28/12, then rail to Pescara, and via Rome and Chiasso to destination, registered (label) cover franked 14D 80l (4Dr 80l surface, 10 Dr AEI reg letter rate. Good franking and great routing. Written up and displayed on album page. Imperial Airways F/F Athens to Alexandria, bs 3/4, carried on the inaugural England-India service, red/cream 'By Imperial Airways/ First Air Mail/Between England & India' souvenir cover franked 5d Navarino black & red, 1d, and 80l, canc Athens cds, large circular violet dated special F/F flight cachet (Goddard 36A). 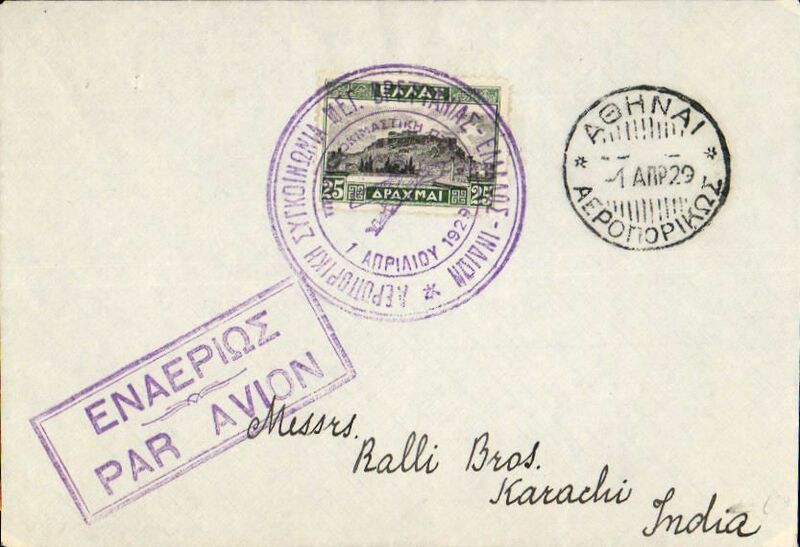 Imperial Airways F/F Athens to Karachi, bs 6/4, carried on the inaugural England-India service, plain cover franked 25d canc fine strike large circular violet dated special F/F flight cachet (Goddard 36A), also Athens Airmail (Goddard P1) dated 1/4/29, violet framed 'Par Avion' hs (Goddard C3). Imperial Airways F/F Athens to Karachi, bs 6/4, carried on the inaugural England-India service, plain cover franked front and verso with SG 411x2, 415x2, 416x2, 420, 421, 429x2, 431 canc seven fine strikes (four on front, three verso) of large circular violet dated special F/F flight cachet (Goddard 36A), red framed 'Par Avion' hs (Goddard C10), and FDI of two Athens 1/4/29 (Goddard P4) cds's verso. 1cm non invasive closed tear top edge, otherwise good. Imperial Airways F/F Athens to London, bs 15/4, carried on the inaugural England-India service, red/cream 'By Imperial Airways/ First Air Mail/Between England & India' souvenir cover franked 5d Navarino black & red & 5d Navarino black & blue, and 80l, canc Athens cds, large circular black dated special F/F flight cachets (Goddard 36A), black framed 'First Return Flight' cachet. 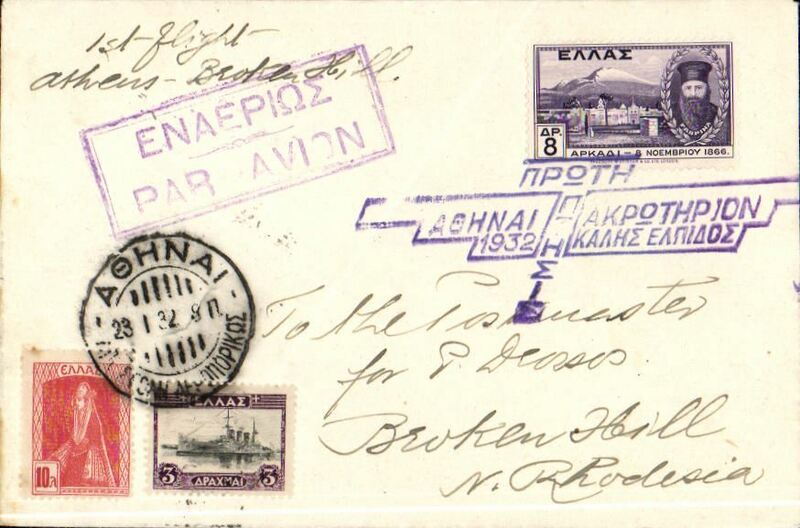 Athens-London, 15/4 Sutton Coldfield arrival ds, carried on the return of Imperial Airways F/F Croydon-Karachi, Drossos corner cover franked 1927 4D & 10D tied by fine strike of special depart cancellation, uncommon large square red Croydon-Karachi 'Aeroplane/Train/Flying Boat' flight cachet x2, one tied by Athens 11 APR 29 cds. Nice item in superb condition. Francis Field authentication hs verso. 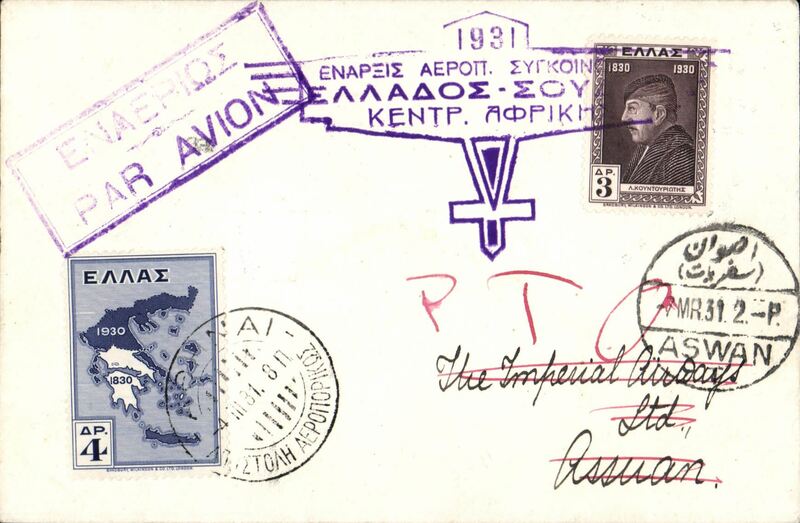 Imperial Airways, F/F Athens to London, 15/4 receiver, Drossos corner cover franked 14d, canc large black circular official flight cachet, also Athens 11/4 cds, rectangular violet 4 line cachet ' First Air mail/Between Indfia & England/via Egypt & Greece', violet framed 'First Return Flight'. Six cm closed tear on front not affecting stamps or cachet, and 4 tone spots. See scan. 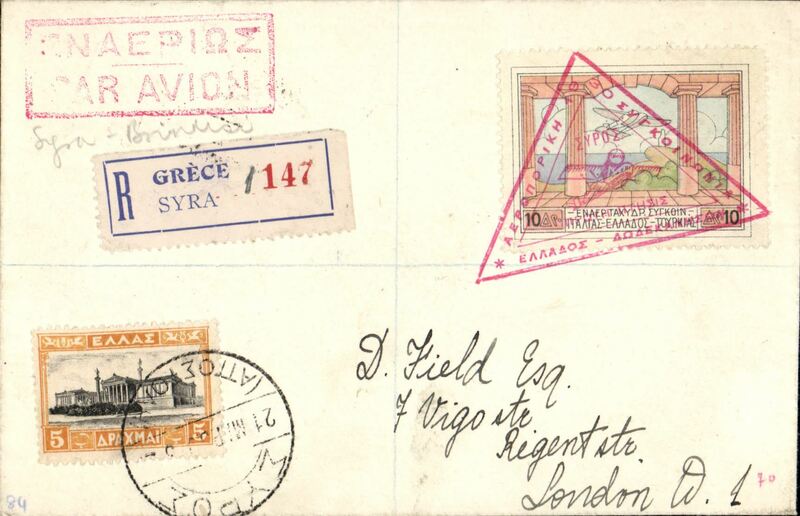 Crete to London, Canada, bs 29/8, flown on Imperial Airways F/F Suda Bay (Crete) to London, UK, registered (label) Drossos cover franked 15d, canc Crete cds tying fine red framed "First Airmail Flight/Suda Bay (Crete) to London" cachet. 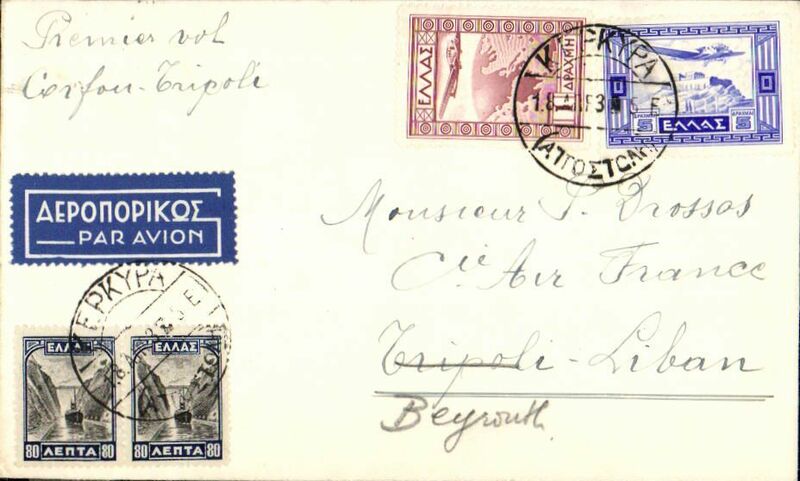 F/F Athens to Beyrouth, bs 8/6, and on to Cairo 11/6, violet circular flight cachet (Goddard 42c), Drossos registered (label) corner cover, Air Union Lignes d'Orient. Aero Espresso Italiana, Patras to USA, bs New York 29/8 carried on F/F revised route Patras to Brindisi, bs 20/8 via Turin 22/8, registerd (abel) cover franked 13Dr (5Dr surface, 8 Dr AEI air surcharge (3D printd matter + 5Dr reg). Turin was distribution centre for USA-Italy mail, from where it would have been forwarded to Genoa to await carriage to USA by ship. Nice item with good routing. Written up and displayed on album page. 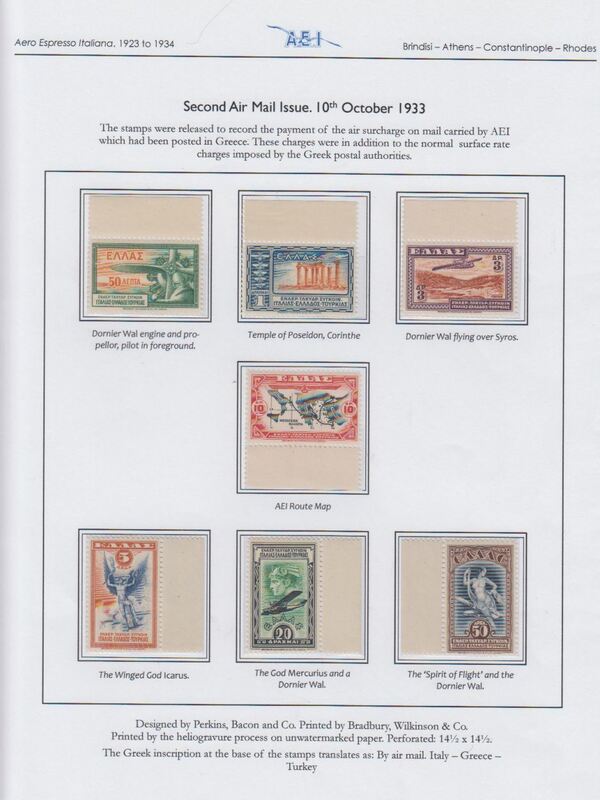 Imperial Airways, Salonika to London, no arrival ds, carried on the second and last first service to the new 'All Air' European service, printed 'Via Air Mail' buff cover franked 1911 2d x2, 10d, canc Salonika cds, dark blue framed Greek airmail cachet, ms 'A Transmettre/jusqua London'. This particular route was followed for two services only, Wingent p26. 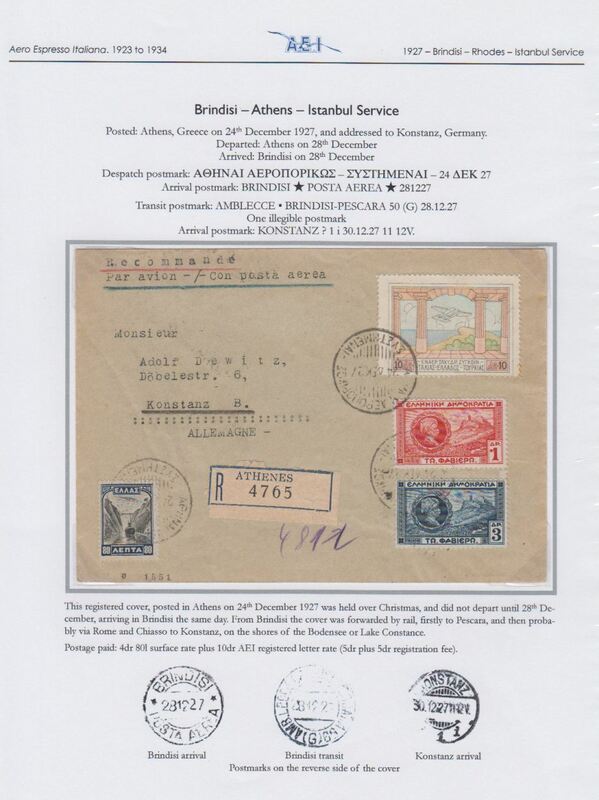 F/F Athens to Patras, 22/9 bs and arrival ds on front, Drossos cover franked 1926 3d air and 40l ordinary, violet framed Athens departure hs, Aero Espresso Italiana S.A.
F/F Athens to Baghdad, bs 22/1, carried on the England-India service, registered (label) Drossos cover franked Independence 1d & 10d, fine strike black circular "First Airmail Greece to Palestine & Iraq/Imperial Airways" flight cachet, purple framed "Par Avion/Jusqu'a (ms) Baghdad" cachet., Imperial Airways. 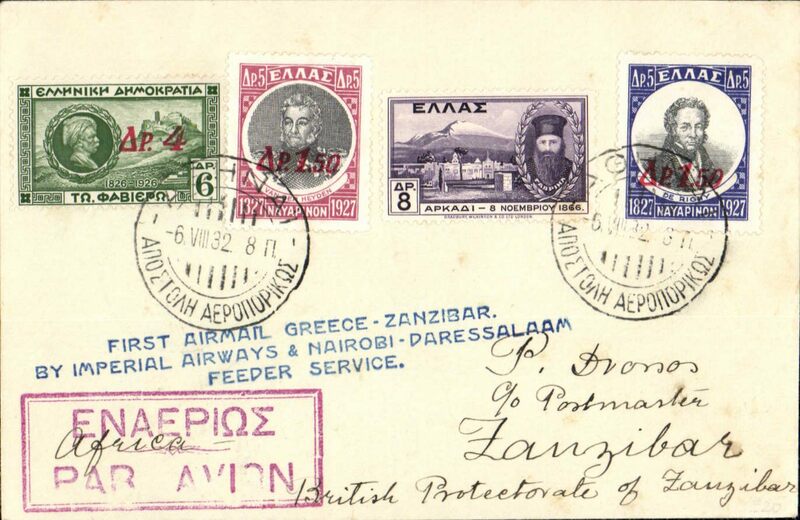 Imperial Airways F/F Athens to Baghdad, bs 22/1, carried on the England-India service, registered (label) Drossos cover franked Independence 1d & 10d, fine strike black circular "First Airmail Greece to Palestine & Iraq/Imperial Airways" flight cachet, purple framed "Par Avion/Jusqu'a (ms) Baghdad" cachet. 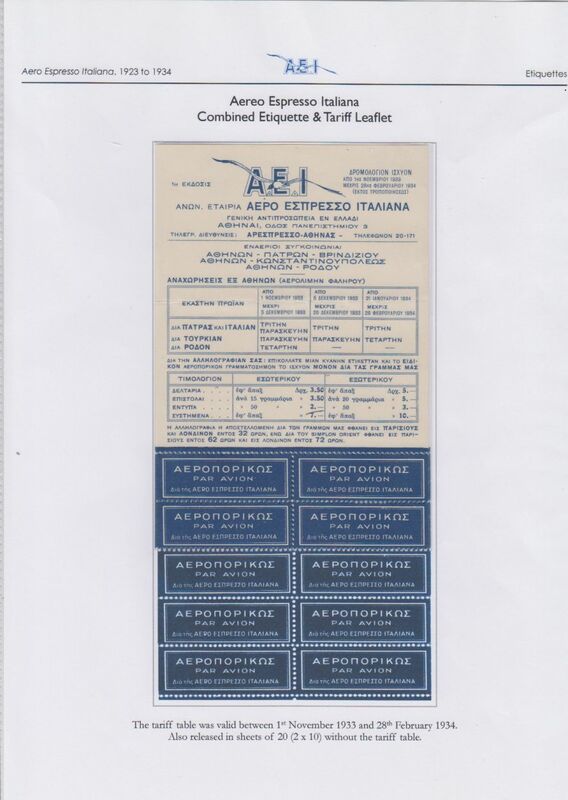 Aero Espresso Italiana, Mytilene replaces Lemnos on the Athens - Istanbul route, F/F Mytilene to Istanbul, b/s 19/2, cover franked 1Dr + 5Dr AEI air surcharge, violet five line first flight cachet. Written up and displayed on album page. 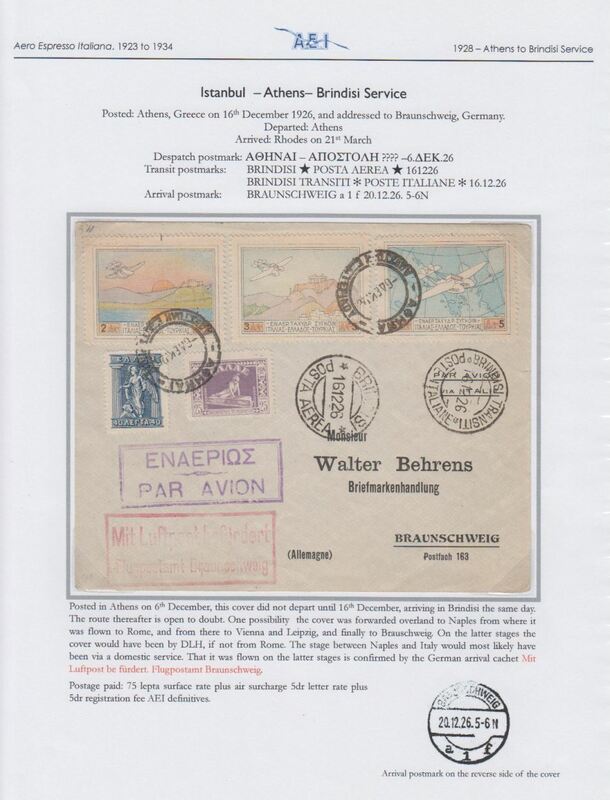 Aero Espresso Italiana, Mytilene replaces Lemnos on the Athens - Istanbul route, F/F Athens to Mytilene, bs 19/2, cover franked 1Dr + 5Dr AEI air surcharge, Written up and displayed on album page. Image. 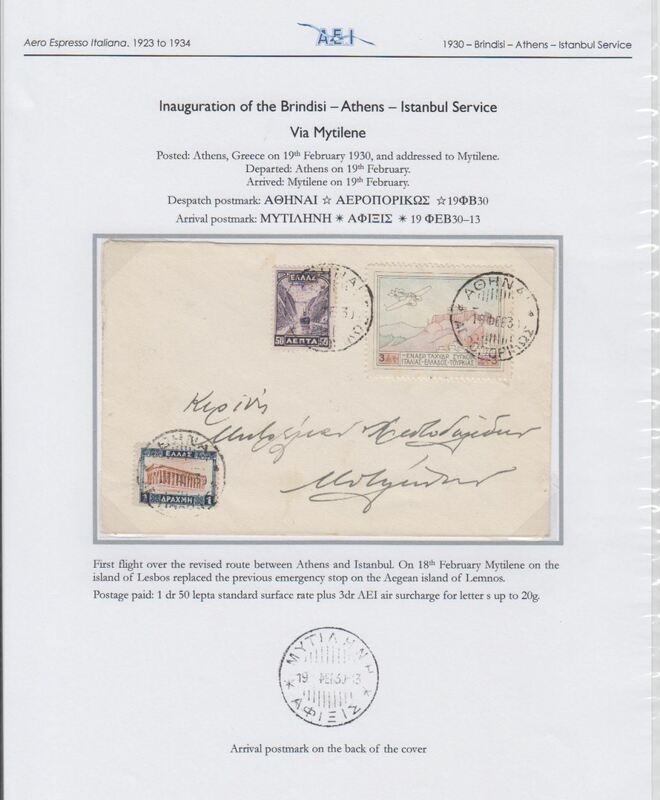 Aero Espresso Italiana S.A., inauguration Brindisi-Athens-Rhodes service, F/F Syros to Rhodes, bs 21/3, cover franked 1926 3D air and 80L ordinary, triangular red framed Athens departure hs. Elegantly presented on album leaf. Image. 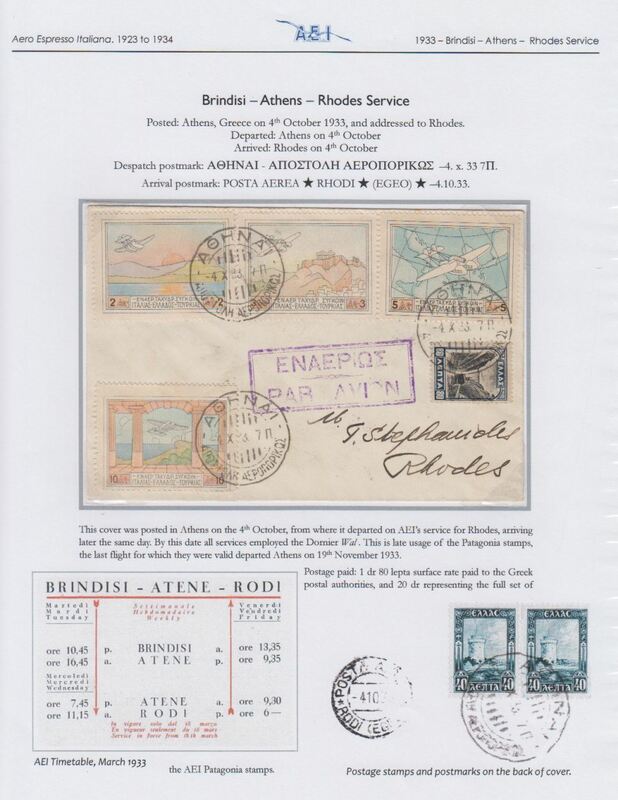 Aero Espresso Italiana S.A., inauguration Brindisi-Athens-Rhodes service, F/F Athens to Simi, bs 23/3 via Rhodes 21/3, cover franked 1926 3D air and 90L ordinary, first use of purple triangular 'Athens-Syros-Dodecanese' flight cachet.. Elegantly presented on album leaf. Image. 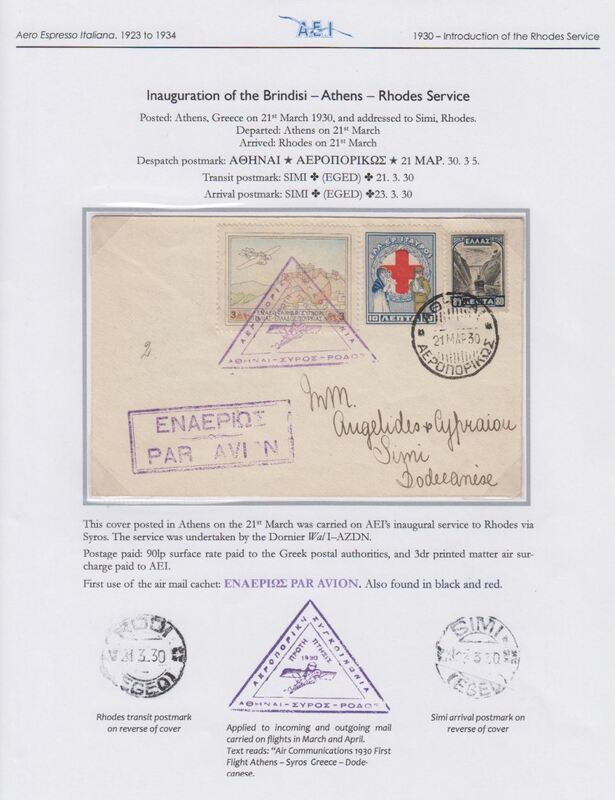 Aero Espresso Italiana S.A., inauguration Brindisi-Athens-Rhodes service, F/F Syros to Brindisi, bs 22/3, cover franked 1926 5dr air and 1dr ordinary, first use of red triangular 'Athens-Syros-Dodecanese' flight cachet.. Elegantly presented on album leaf. Image. 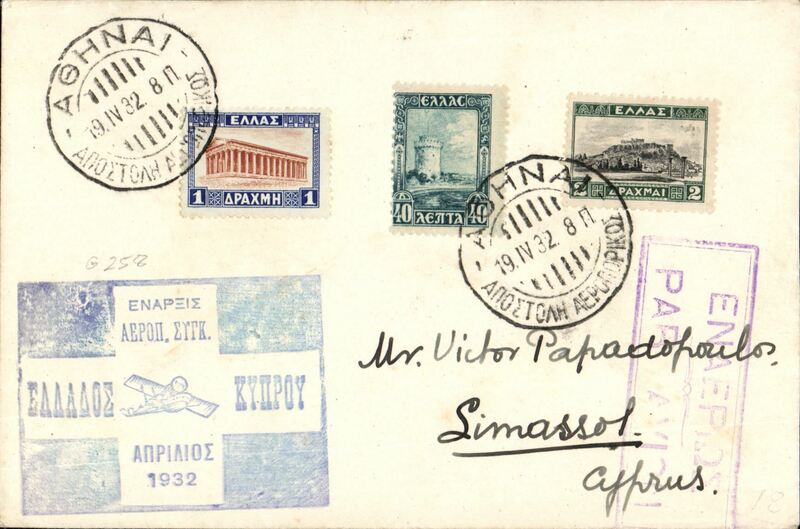 F/F Syros to Brindisi, bs 22/3, Drossos registered (label) cover franked 1926 10D air and 5D ordinary, red framed Athens departure hs, Aero Espresso Italiana S.A. 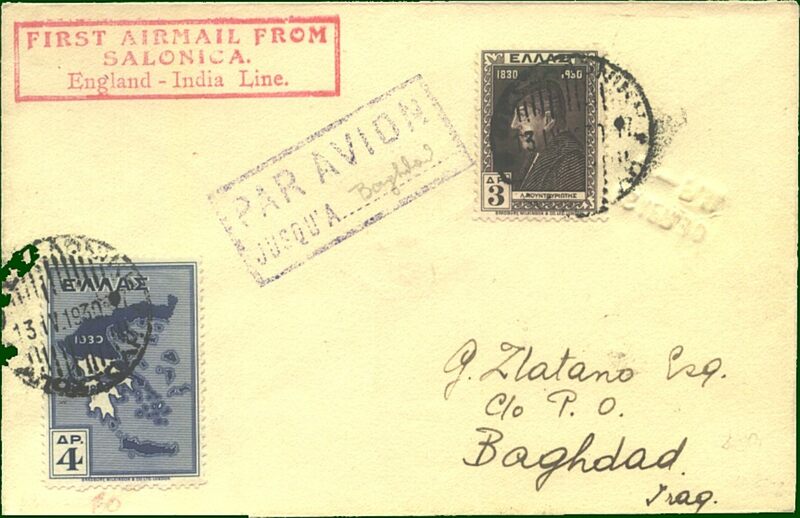 Scarce Imperial Airways F/F Salonika to Baghdad, bs 16/4, carried on the England-India service, plain Drossos cover franked Independence 3d & 4d, fine strike red framed "First Airmail frm/salonika/England-India Line" flight cachet, blue framed "Par Avion/Jusqu'a (ms) Baghdad" cachet. Only 19 flown. 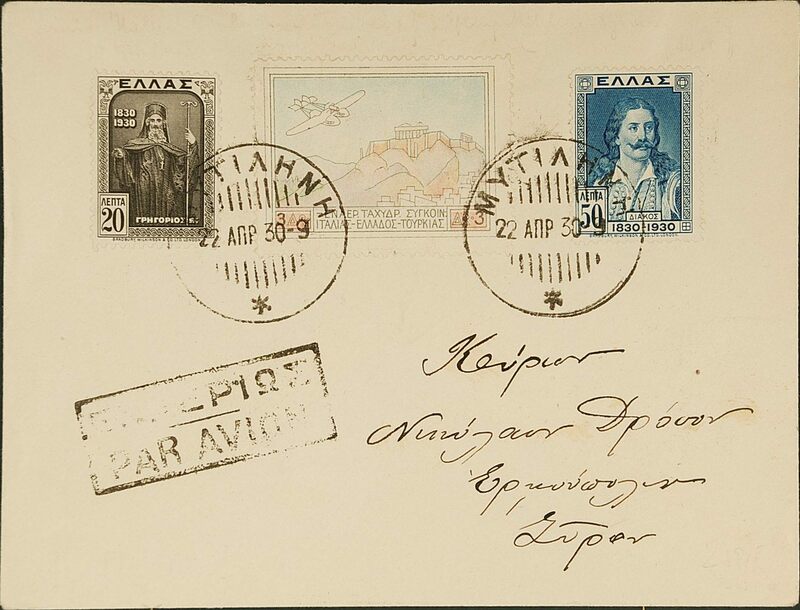 Scarce Imperial Airways F/F Salonika to Basra, bs 17/4/30, registered (label) Drossos cover franked Independence 10l, 15d, fine red framed "First Airmail from/Salonica/England-India Line", blue/black framed "Par Avion/Jusqu'a…" cachet. Only 13 flown. 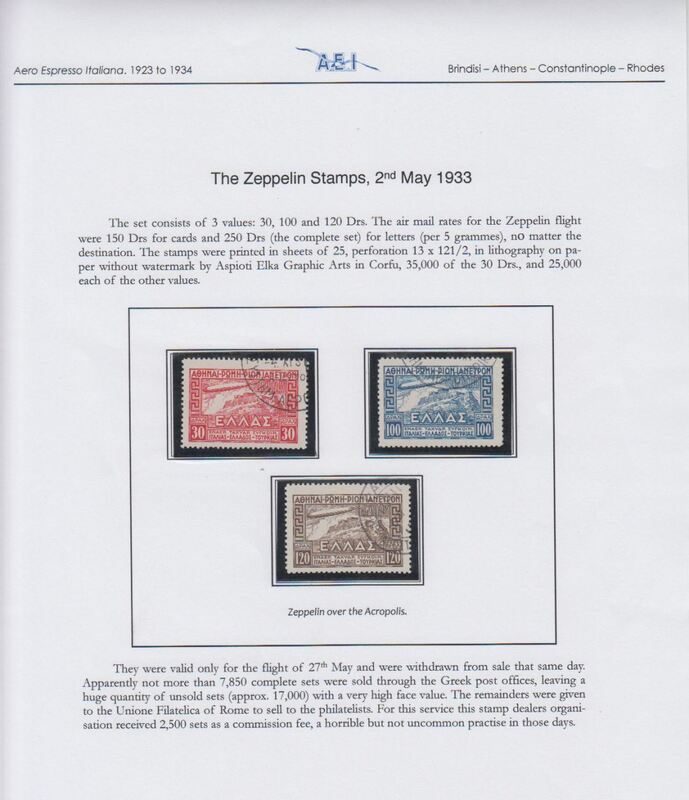 Aero Espresso Italiana S.A., first direct flight from Mytilene to Syra, bs 25/4, plian cover franked 1926 Aropolis 3d air and 50, 20 ordinary, canc Mytilene 22/4 cds, black framed bingual Par Avion hs. Only 10 flown. 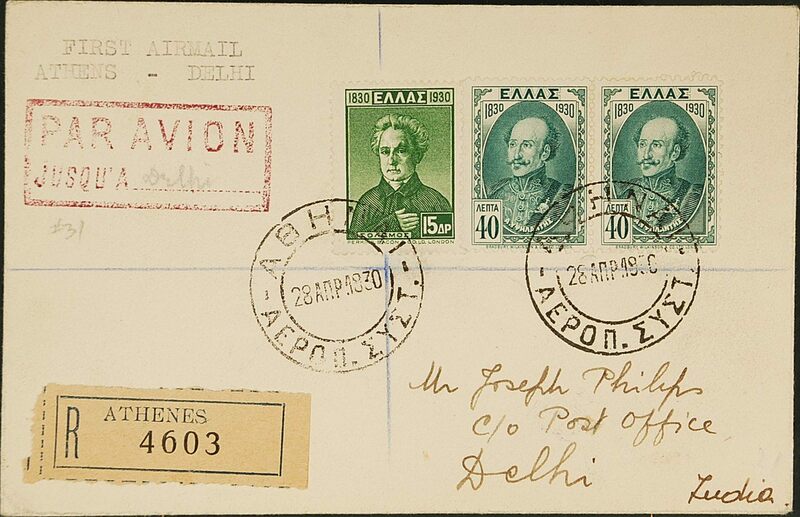 Imperial Airways, F/F Athens to Delhi, bs 3/5, registered (label) cover franked 15d 80l, canc Athens Reg airmail cds, framed magenta Jusqu'a (ms) Delhi, 63 flown. 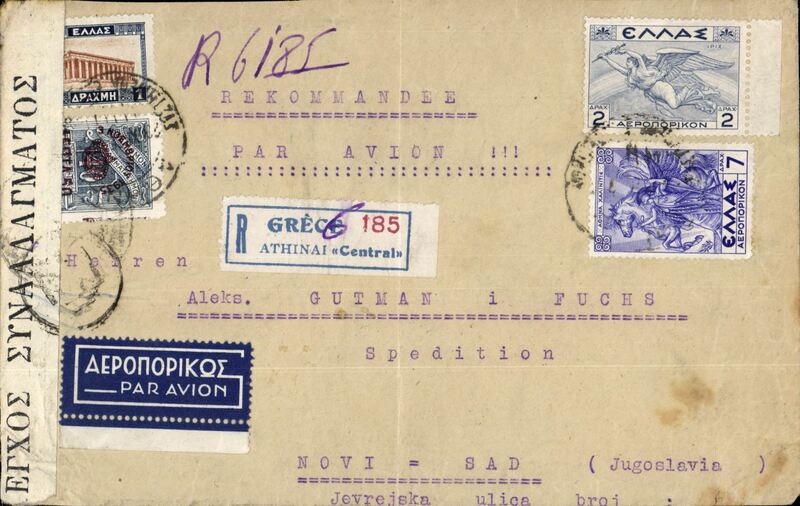 Air Orient Co, first airmail Athens-Corfu, 11/6/40 arrival ds on front, franked 2d40, canc usual Athens P1 airmail cancel, also red C2 boxed Greek airmail cachet. 73 flown, some are known to have arrival cancellation 11/6/40 instead of 11/6/30, see Field p239 and Goddard p71. A nice item in superb condition. 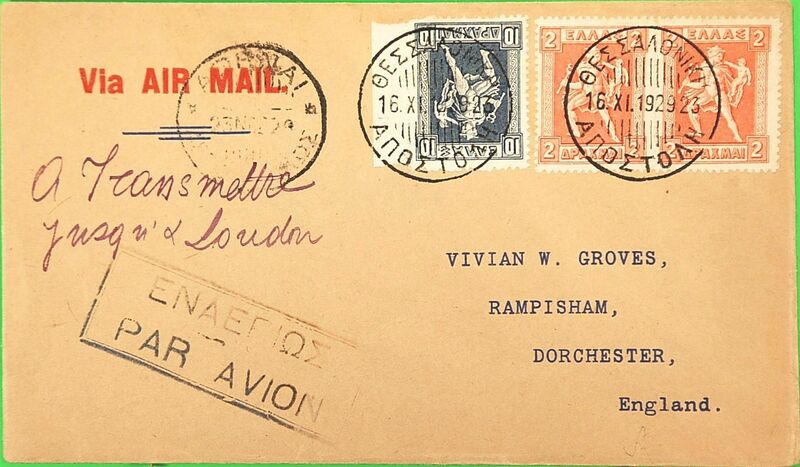 Imperial Airways F/F Athens to Vienna, 3/8 arrival ds on front, carried on inaugural Delhi-Croydon service, plain cover franked Independence 50l,1d red,1d orange,1.50d, red straight line 'Imperial Airways' hs, violet boxed 'Athens' C4 airmail cachet. 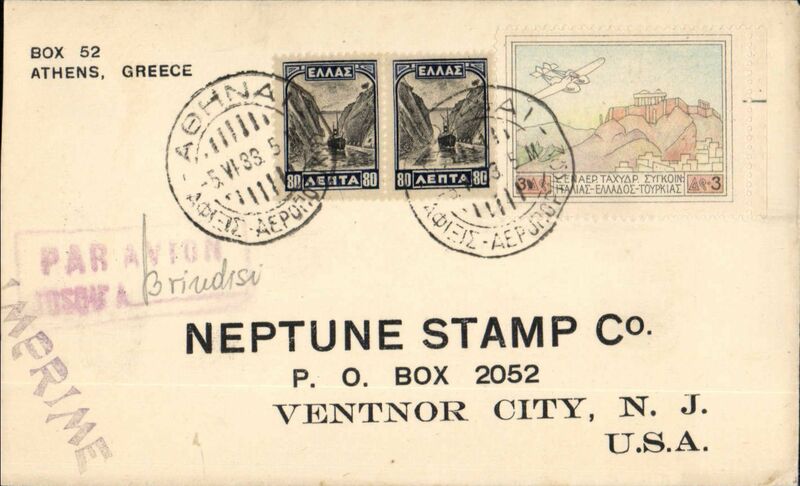 First acceptance of mail for USA, Athens to New Jersey, bs Rockville 13/8, for carriage on Imperial Airways F/F Athens to Vienna, bs 3/8, via New York 13/8, registered (label) Drossos cover franked Independence 1d,2d,5d, red st line 'Imperial Airways' hs, black boxed "Par Avion/Jusqu'a (ms) Wien" ms "First Airmail/Athens-Vienna". 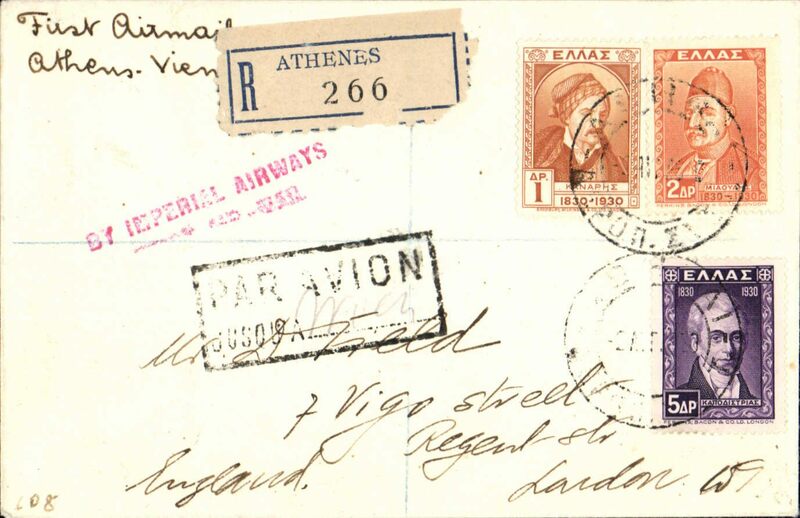 Imperial Airways F/F Athens to Vienna , bs 3/8, plain registered (hs) cover franked 8dr, canc Athens 2/8 cds, red two line "By Imperial Airways/…..Air Mail" flight cachet, black framed "Par Avion/Jusqu'a (ms WIEN)", ms First Airmail/Athens-Vienna". This cover is also a F/F of the accelerated India-England service, when the rail section of the European section was reduced to just between Salonika and Uskub. An interesting item in fine condition. 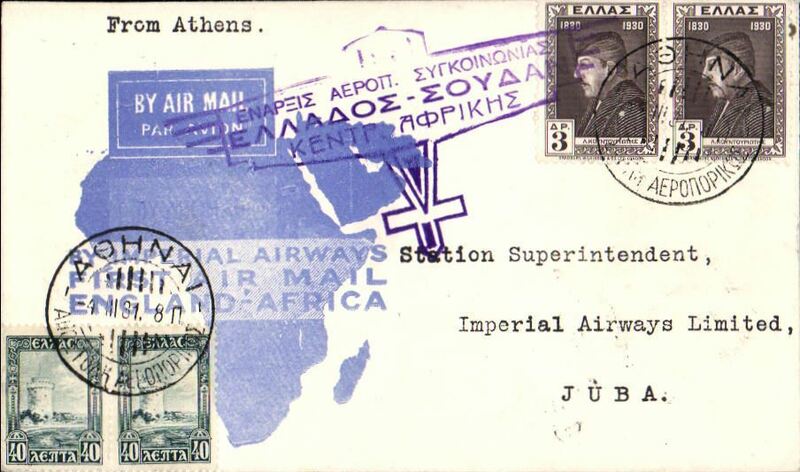 Greece acceptance, cover flown Athens to Khartoum, bs 7/3, and on to Juba, 19/3, carried on Imperial Airways F/Croydon/Mwanza, official souvenir blue map cover, franked 86d, violet winged "Greece-Sudan" inauguration cachet. 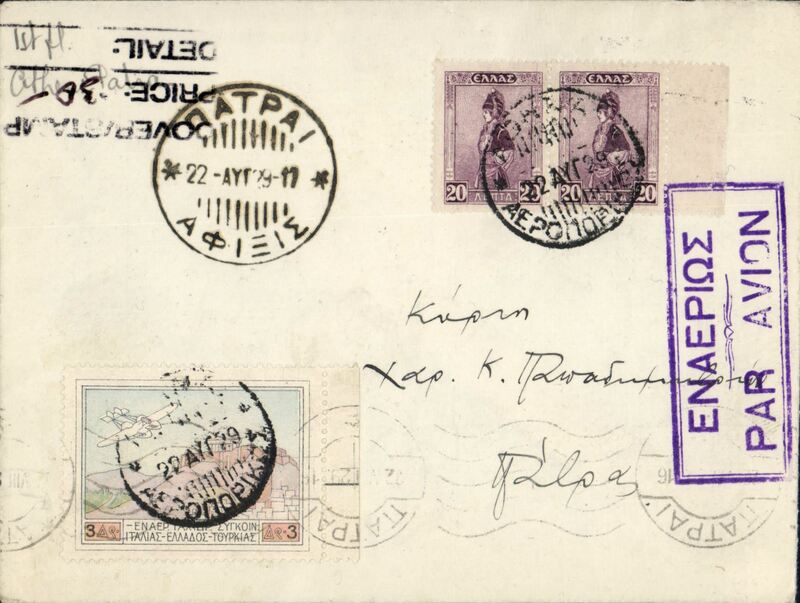 Greece acceptance for the first England-East Africa flight, Athens to Kisumu, bs 10/3, purple winged Athens depart cachet, plain cover franked 8d 4l, canc Athens cds. 176 flown to Mwanza including those dropped at Kisumu. 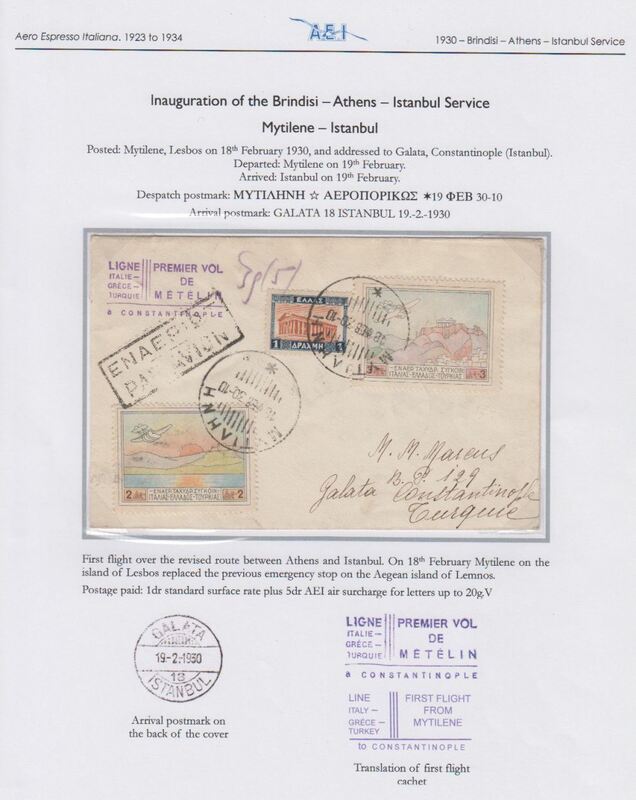 Imperial Airways, F/F Athens to Aswan, bs 6/3, carried on inaugural Croydon/Mwanza service, Drossos blue/white souvenir map cover franked Independence 10l, 50l,1,50d & 2d, canc Athens cds and tied by violet winged "Greece-Sudan" inauguration cachet. 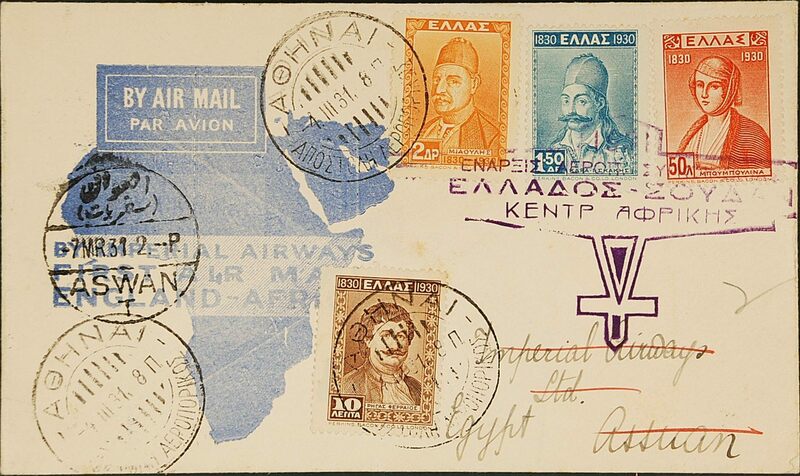 Imperial Airways, F/F Athens to Aswan, bs 6/3, also 7/3 arrival cds on front, carried on the inaugural Croydon/Mwanza service, plain cover franked 4l canc Athens cds, and 3l tied by official winged 'Athens-Aswan' flight inauguration cachet. Image. 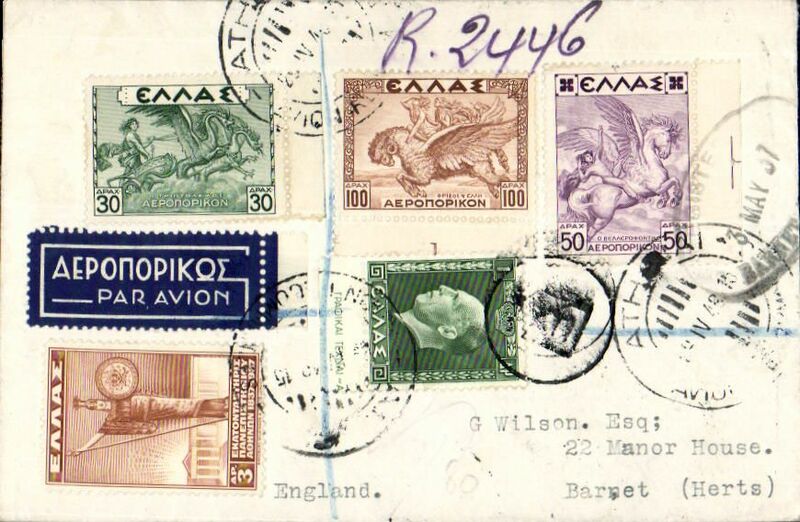 Imperial Airways first and last flight Heraklion (Crete) to Paris and London, bs Dorset, England 28/5, carried on the India-England service, registered (label) Drossos cover franked 10l R & 8d canc Heraklion cds, fine strike red framed "Imperial Airways/First Flight/Heraklion (Candia) Crete/to/Paris & London" flight cachet, early use of Greek purple framed C8 'Iraklion' airmail cachet. This item is of interest for three reaons - (1) the intended srvice was interupted because the incoming flight 'Satyrus', from Alexandria, made a forced touch down at Heraklion but managed to power on to Mirabella Bay. The two bags made up at Heraklion were therefore handed to the Imperial Airways M/Y 'Imperia' and taken to the new plane at Mirabella Bay, see Field p246. (2) hereafter IAW rerouted the service to Mirabella Bay so this was the first,and the last service from Heraklion to Paris, and ( 3) this was the first service of the new summer timetable IW111, see Wingent p58. Super exhibit item in pristine condition. 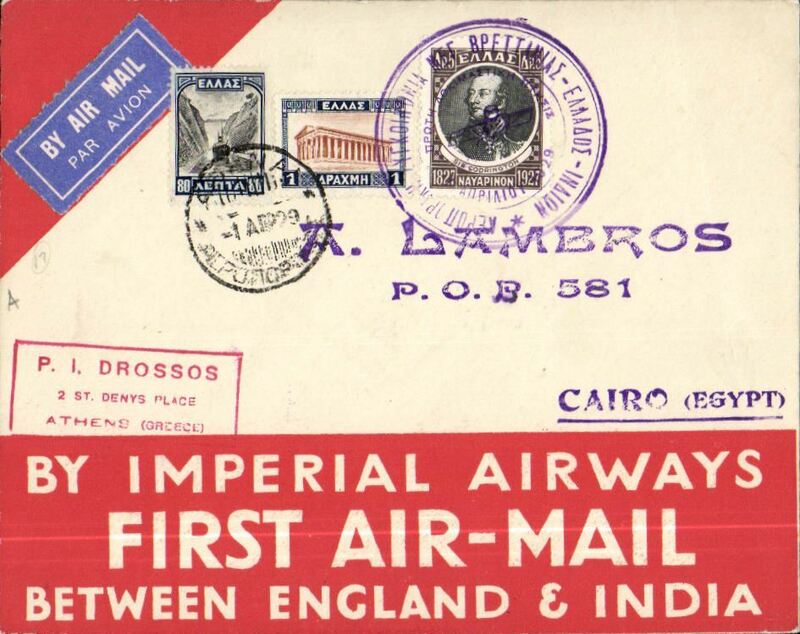 Imperial Airways first and last flight Heraklion (Crete) to Paris, bs 27/5, bs 22/1, carried on the India-England service, plain Drossos cover franked Independence 40l,3d, fine strike red framed "Imperial Airways/First Flight/Heraklion (Candia) Crete/to/Paris & London" flight cachet, first use of Greek purple framed C13a airmail cachet. This item is of interest for three reaons - 1) the intended srvice was interupted because the incoming flight 'Satyrus', from Alexandria, made a forced touch down at Heraklion but managed to power on to Mirabella Bay, 2) hereafter IAW rerouted the service to Mirabella Bay so this was the first,and the last service from Heraklion to Paris, and 3) this was the first service of the new summer timetable IW111, see Wingent p58. Super exhibit item in pristine condition. 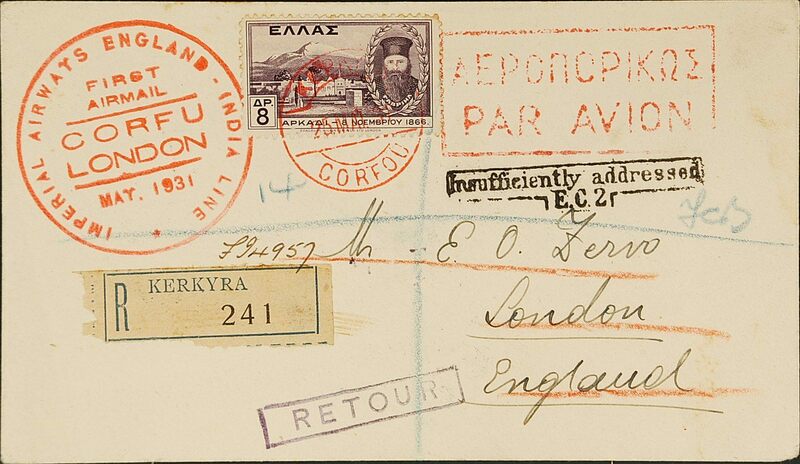 Imperial Airways, F/F Corfu to London, bs 28/5, registered (label) cover franked 8d, canc red Corfu cds, via Athens, large red boxed bilingual Athens "Par Avion" cachet, on front. First acceptance for USA from Crete, Crete to Oregon, bs Portland 29/11, via Brindisi 12/11, 'Amb Brindisi-Bologna, TPO 12/11, 'Turin Ferr. 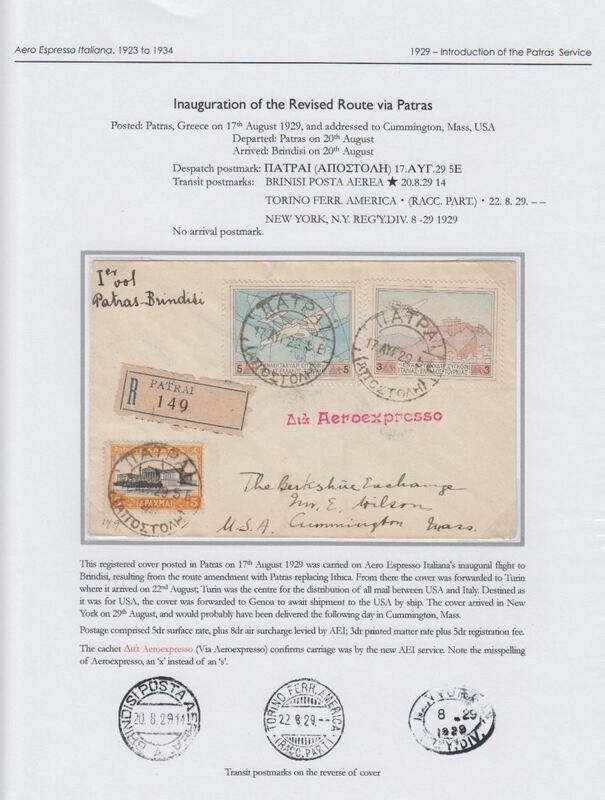 America' 14/11, & Chicago 27/11 transit cds's, flown on Imperial Airways F/F Mirabella Bay (Crete) to Brindisi, Drossos registered (label) cover franked 1927 10lx3, 1d & 5d, black framed "Par Avion/Jusqu'a (ms) Brindisi" hs tying purple framed "First Airmail/Mirabella Bay (Crete)-Brindisi/England-Africa Line" flight cachet. Great routing. Crete to Oregon, USA, bs 29/11, via Brindisi 12/11, Turin Ferr. America 14/11 and Chicago 27/11 transit cds's, flown on Imperial Airways F/F Mirabella Bay (Crete) to Brindisi, Drossos registered (label) cover franked 1927 10lx3, 1d & 5d, black framed "Par Avion/Jusqu'a (ms) Brindisi" hs tying purple framed "First Airmail/Mirabella Bay (Crete)-Brindisi/England-Africa Line" flight cachet. Nice routing. 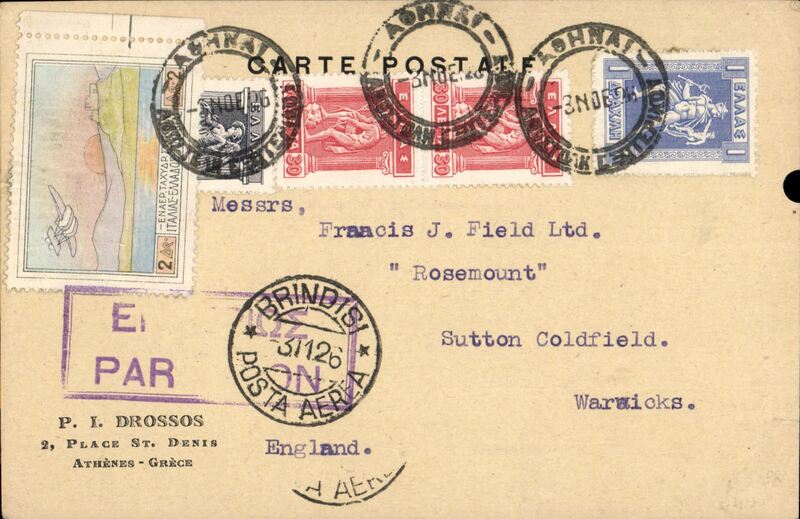 Imperial Airways, F/F Athens to Cape Town, bs 2/2, carried on inaugural England-South Africa service, Drossos plain cover franked 1927 3d&10d, canc Athens cds and tied by red winged "England-South Africa" inauguration cachet. 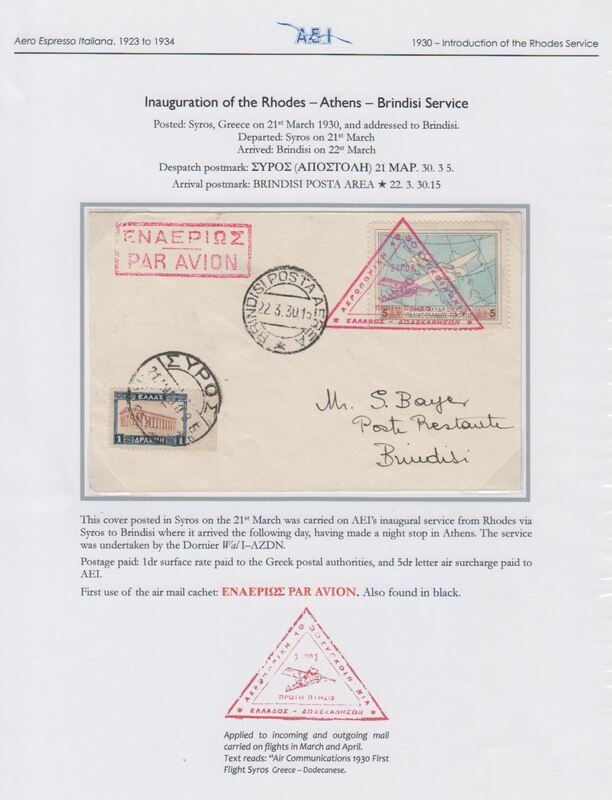 Athens to Cape Town, bs2/2, carried Imperial Airways first regular London to Cape Town service, plain cover franked 13d, canc Athens cds, red winged " England-South Africa Service" inauguration cachet, violet framed bingual Par Avion hs. 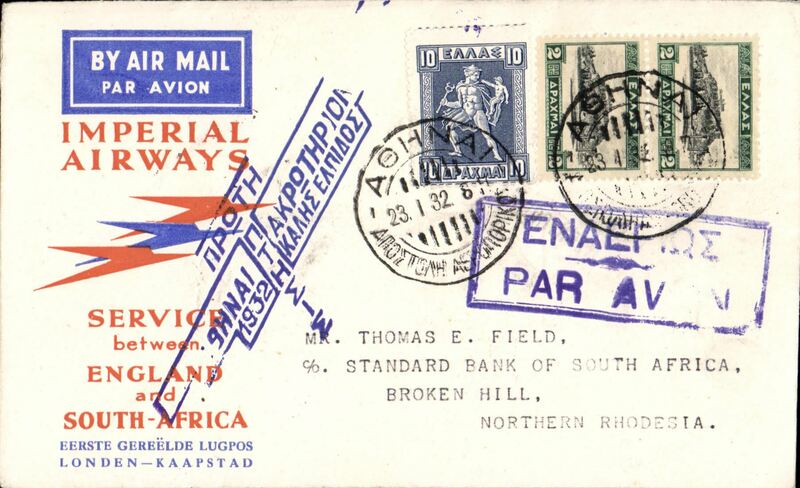 Athens to Cape Town, bs2/2, carried Imperial Airways first regular London to Cape Town service, Springbok souvenir cover franked 16d, canc Athens cds, blue winged " England-South Africa Service" inauguration cachet, blue framed bingual Par Avion hs. 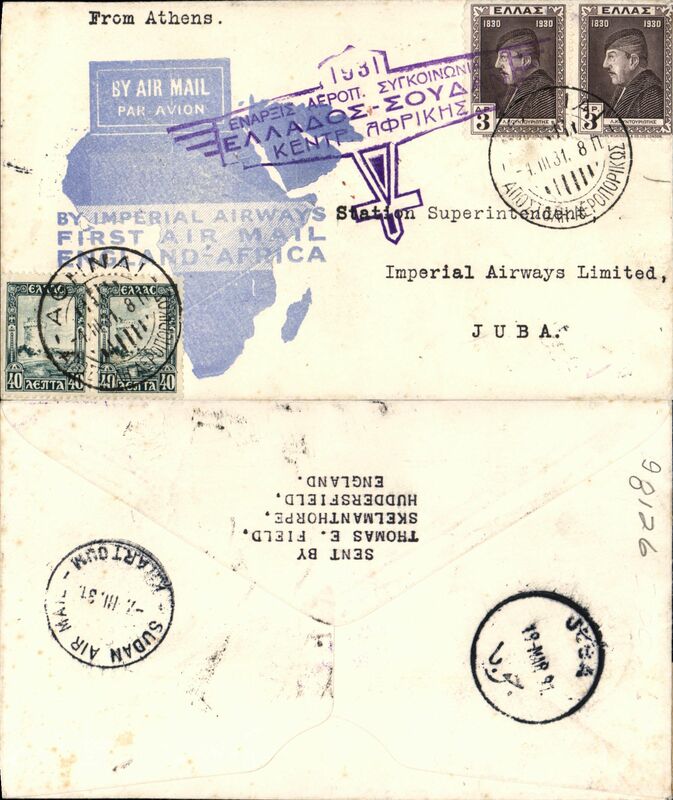 Imperial Airways, F/F Athens to Moshi (Tanganyika), bs 28/1 (via Nairobi), carried on inaugural England-South Africa service, springbok souvenir cover franked 10d, canc Athens cds tied by blue framed "Par Avion/Jusqu'a (ms) Nairobi" hs. 80 flown to Nairobi, so significantly fewer to Moshi. 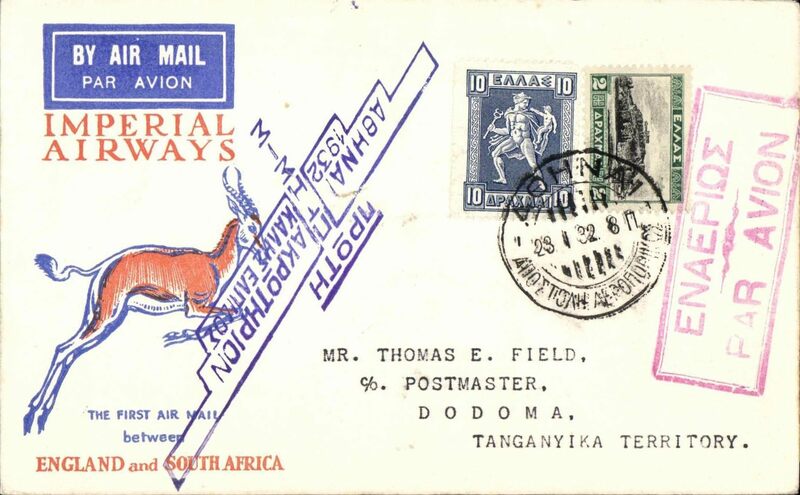 Imperial Airways, F/F Athens to Dodoma(Tanganyika), bs 28/1 (via Nairobi), carried on inaugural England-South Africa service, springbok souvenir cover franked 12d, canc Athens cds tied by red framed bilingual Par Avion hs, elaborate blue 'winged' flight cachet. Eighty flown to Nairobi, so significantly fewer to Dodoma. Imperial Airways, F/F Athens to Broken Hill, bs 30/1, plain cover franked 21Dr, canc Athens 23 1 32 dispatch cds, special violet 'winged' Athens-Broken Hill 235A Godden flight cachet, violet framed 'airmail' hs. Imperial Airways, F/F Athens to Broken Hill, bs 30/1, plain cover franked 14Dr, canc Athens 23 1 32 dispatch cds, fine strike special violet 'winged' Athens-Broken Hill 235A Godden flight cachet, violet framed 'airmail' hs. 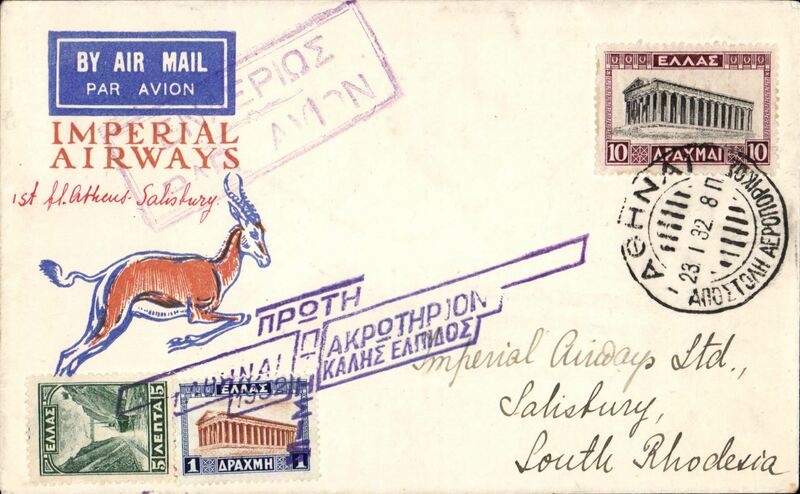 Imperial Airways, F/F Athens to Salisbury, bs 31/1, Sprinbok souvenir cover franked 16Dr, canc Athens 23 1 32 dispatch cds, special violet 'winged' Athens-Salisbury 235G Godden flight cachet, violet framed 'airmail' hs. 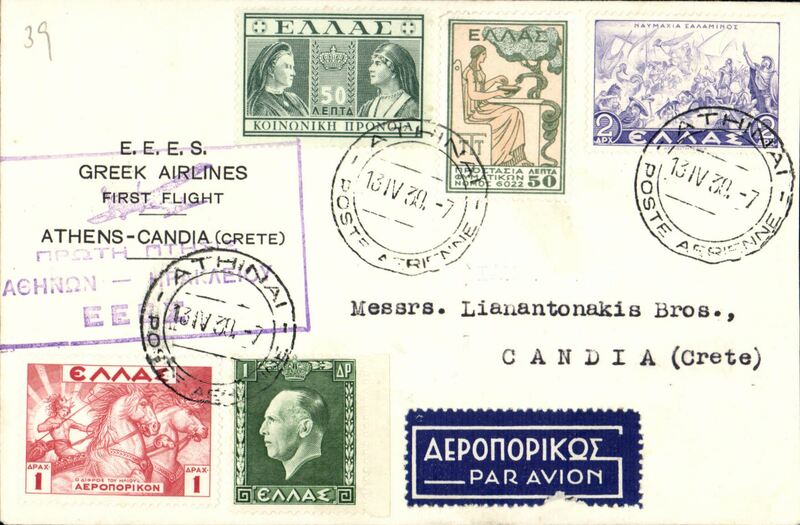 F/F Athens to Limassol, cachet (Goddard G258), boxed violet bilingual par Avion hs, Imperial Airways. 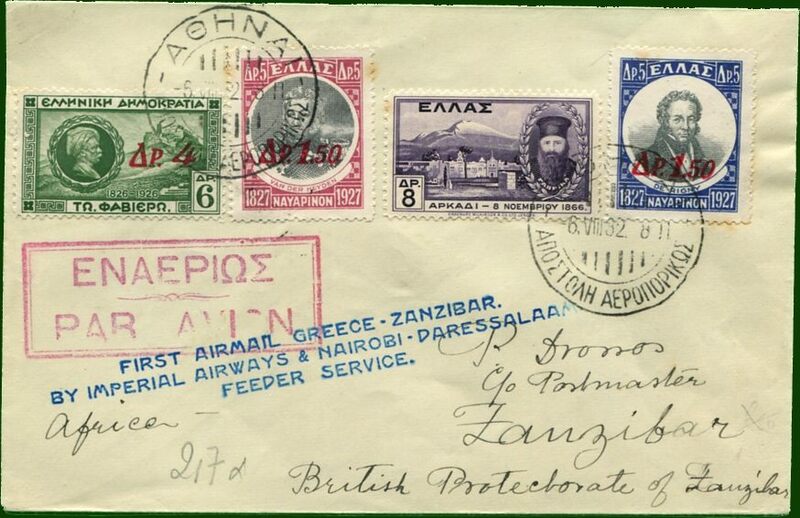 Athens to Zanzibar, bs 13/8, Athens, canc Field type P11 postmark, blue three line "First Airmail Greece-Zanzibar/By Imperial Airways & Nairobi-Dares salaam/Feeder Service", red boxed Athens airmail cachet (Field type C2), Drossos cover with Francis Field authentication hs verso. 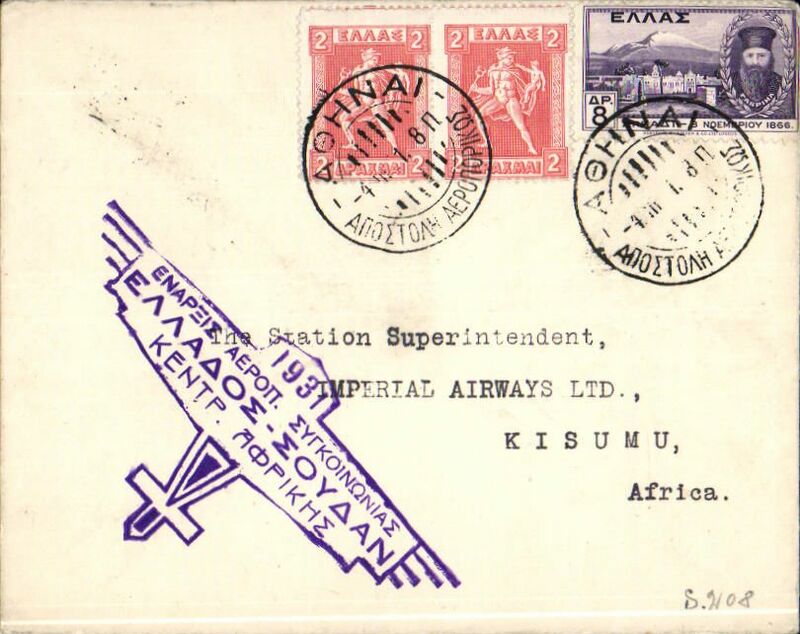 One of 74 items intended to be flown to Zanzibar by the first Wilson Airways Coastal Service but, due to a delay to the commencement of the service, was flown by Imperial Airways flight AS 75 to Dodoma, and then sent by train and steamer to Zanzibar. A similar cover was illustrated in the June 2002 edition of the Imperial Airways Gazette and described as a "very rare item and, as far as is known, not seen previously by anyone in the (Imperial Airways Study) group. 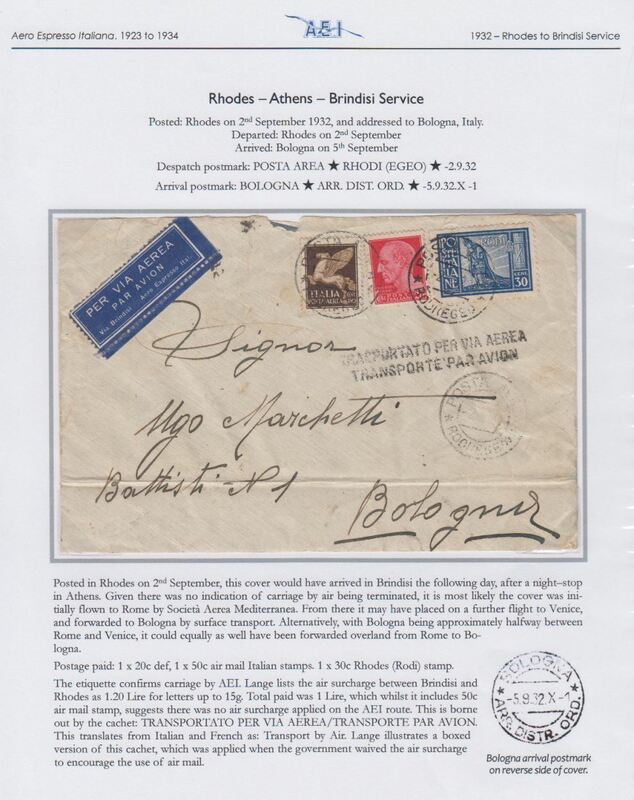 Rhodes to Bologna, 5/9, plain cover dual franked with Italian 20c ordinary and 50c air stamps and 30c Rhodes stamp, both canc Rhodes cds's, dark blue/white 'Per via Aerea/Via Brindisi/Aero Espresso Ital.' etiquette, and black two line 'Transportato per Via Aerea/Transporte Par Avion' hs (applied when government waived the air surcharge to encurage the use of air mail. Small non invasive top edge nibble, some flap damage verso, and ironed horizontal crease 2cm from lower edge. A most interesting cover elegantly presented on album leaf. Image. Imperial Airways/TATA, Athens to Madras, bs 16/10, carried on F/F IAW Athens to Karachi and F/F TATA Karachi-Madras feeder service connecting with IAW Karachi-London, plain cover franked 1927 1.50/5d & 2/5d opts, 1927 10d & Independence 10d, purple "1 Flight Athens-Bombay-Madras/Imperial Airways/England-India Line" flight cachet, black framed " Karachi-Madras/15 Oct 1932/First Airmail" cachet, red framed Athens airmail cachet. 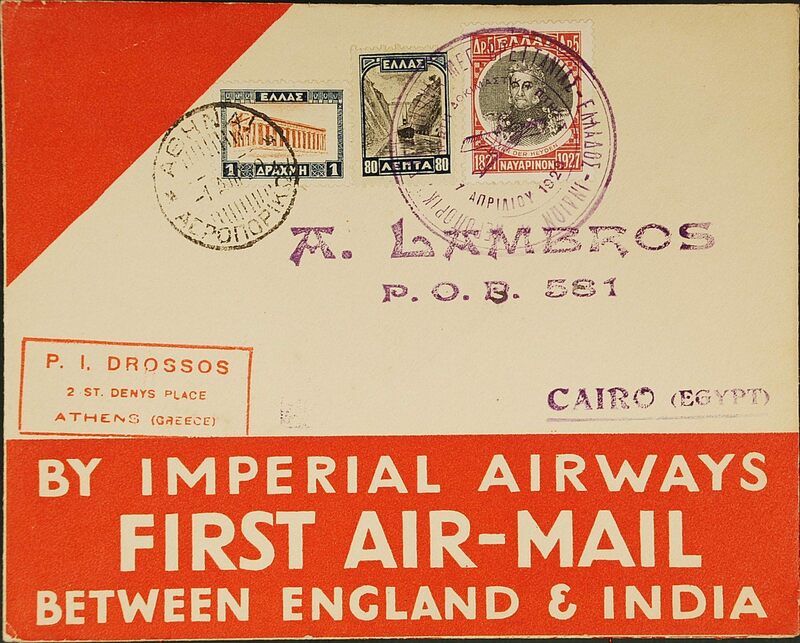 Imperial Airways, F/F Athens to Bahrain, bs 10/11, carried on IAW carried on the India-England service, plain Drossos cover franked 1927 1.50d/5d x2, 2d/3d, 2d/5d x3, & 4d/6d opts, canc Athens cds, fine strike circular "By the New Itinerary of the England Dar es Salaam/Feeder Service" flight cachet, red st line "By Imperial Airways" hs. Nice item in pristine condition. 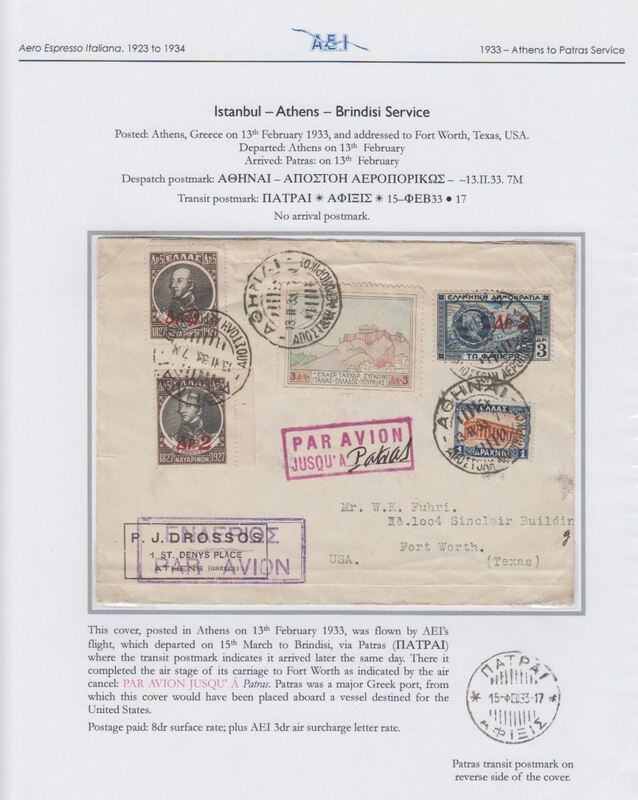 Athens to Fort Worth, Texas, via Patras 15/2 where it completed the Aero Espresso Italiana air stage of its journey, signified by a superb red framed Jusqu'a 'Par Avion/JUSQU'A (ms) Patras', a major Greek port from which the cover would have been put on a vessel destined for the US. An interesting cover elegantly presented on album leaf. Image. Image. 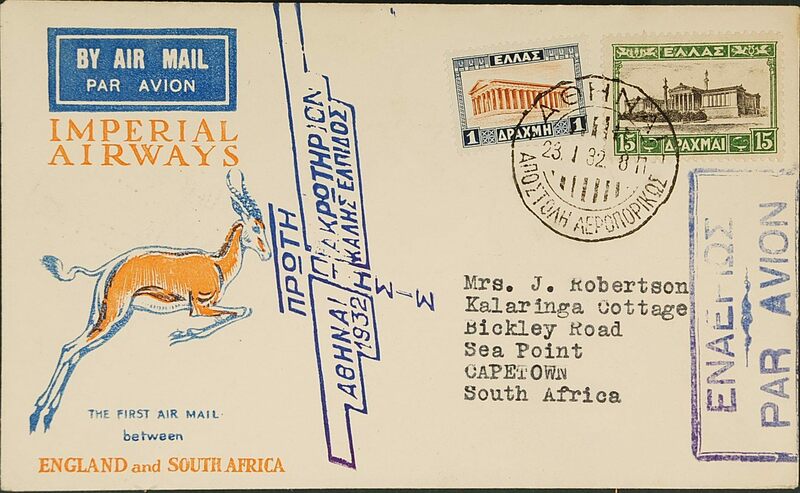 Imperial Airways first accelerated London-Cape Town service reduced from 11 to 10 days, Athens to Nairobi, bs 2/5, Government Ministry cover, 22x11cm, franked 9d25, canc Athens cds. Carried on Flight AS113, see Wingent Movements of Aircraft on the African Route 1931-39, P Wingent, p40. Ironed vertical folds, do not detract. Aero Espresso Italiana, Zepplin set of 3, fine used. Written up and displayed on album leaf.See scan. Athens to New York, carried on the Aero Espresso Italiana service to Brindisi 3/6 where it would have completed the air stage of its journey, signified by a red framed Jusqu'a 'Par Avion/JUSQU'A (ms) Brindisi', then likely surface to the North America sorting office in Turin, then on to Genoa for dispatch by ship to New York, printed cover, 'imprime' hs, franked the printed matter rate of 1dr60l surface and 3dr air surcharge. Interesting cover elegantly presented on album leaf. Image. 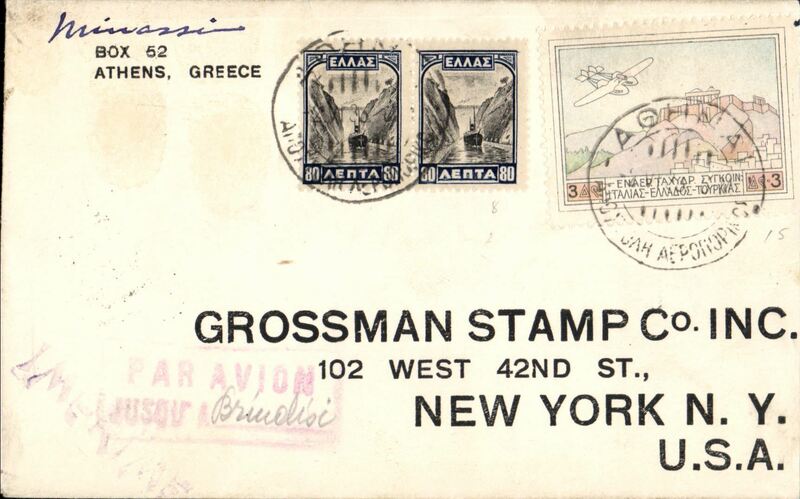 Athens to New York, flown as far as Brindisi, Brindisi Posta Aerea 3/6 transit cds, plain cover franked 3D 'Acropo;is' air and 2x 80l, red framed 'Par Aviion/Jusqu'a (ms) Brindisi' hand stamp. Image. 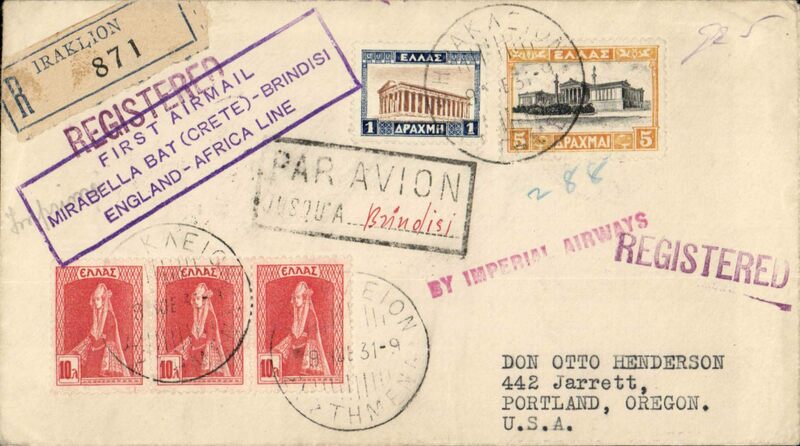 Imperial Airways, Greece to USA, via Brindisi 6/6, carried from Athens to Brindisi on the IAW Karachi-Croydon service, then by sea to US, printed commercial corner cover franked 3d Acropolis & 1927 80l x2, red boxed "Par Avion/Jusqu'a (ms) Brindisi. Attractive item. 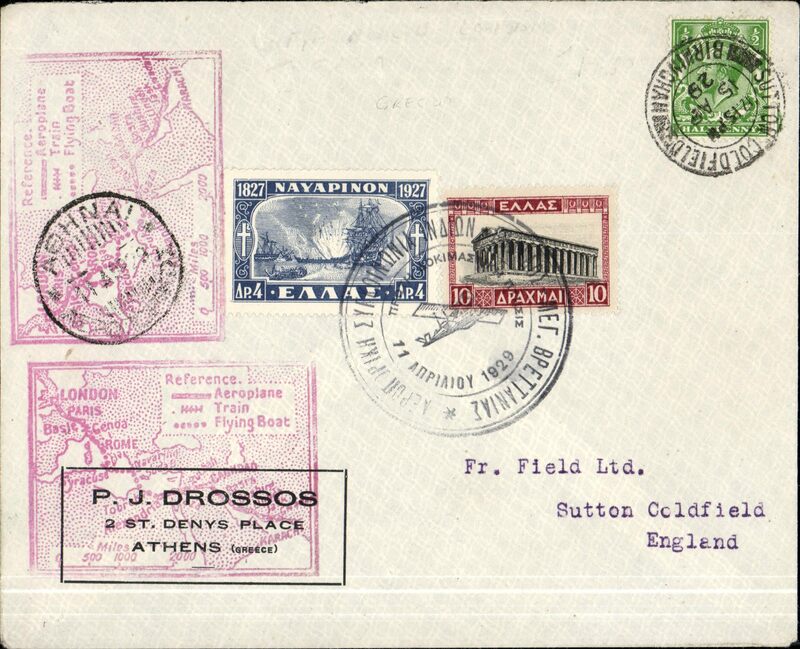 Late use of 1926 Flying Boat stamps, Athens to Rhodes, bs 4/10, plain cover franked 20 dr Flying Boat set + 1dr 80l surface postage. 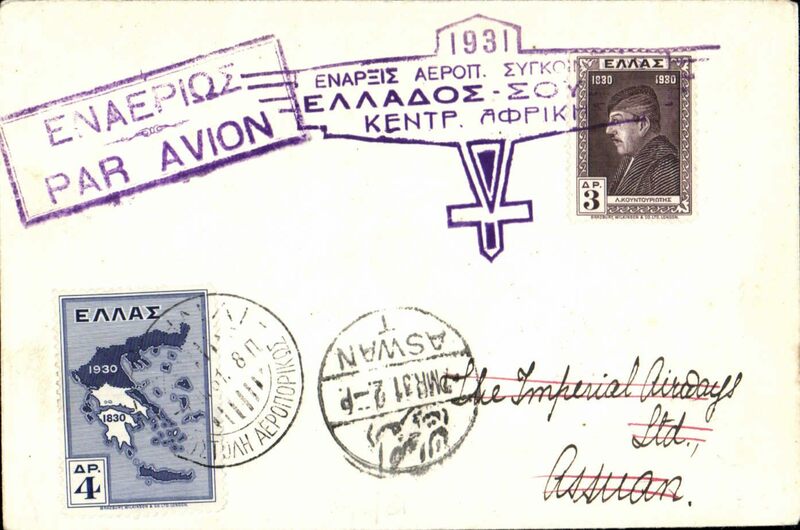 The last flight for which the Flying Boat stamps were valid left Athens on 19/11/33. Elegantly presented on album leaf. Image. 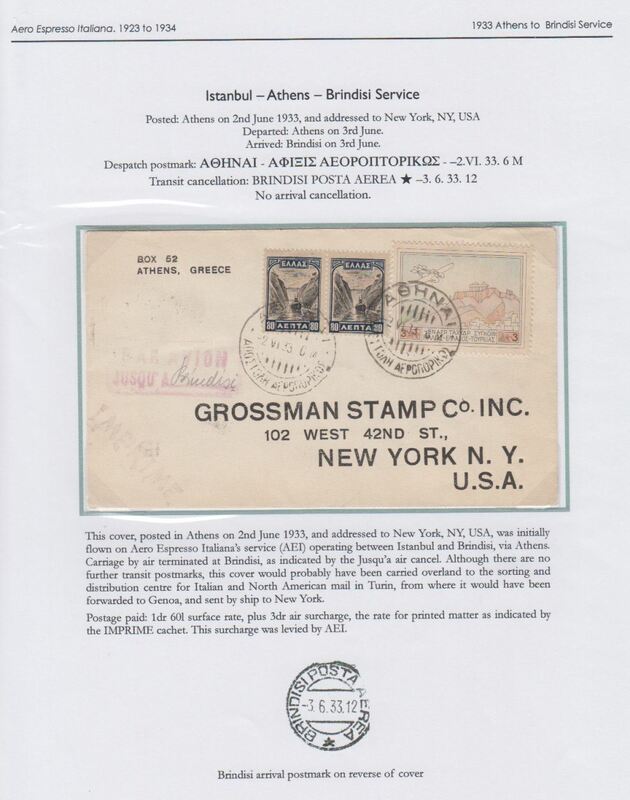 Aero Espresso Italiana, Second Airmail issue, mnh. Written up and displayed on album leaf.See scan. Aero Espresso Italiana combined etiquette and tariff leaflet issued 1/11/1933, written up and displayed on album leaf. See scan. 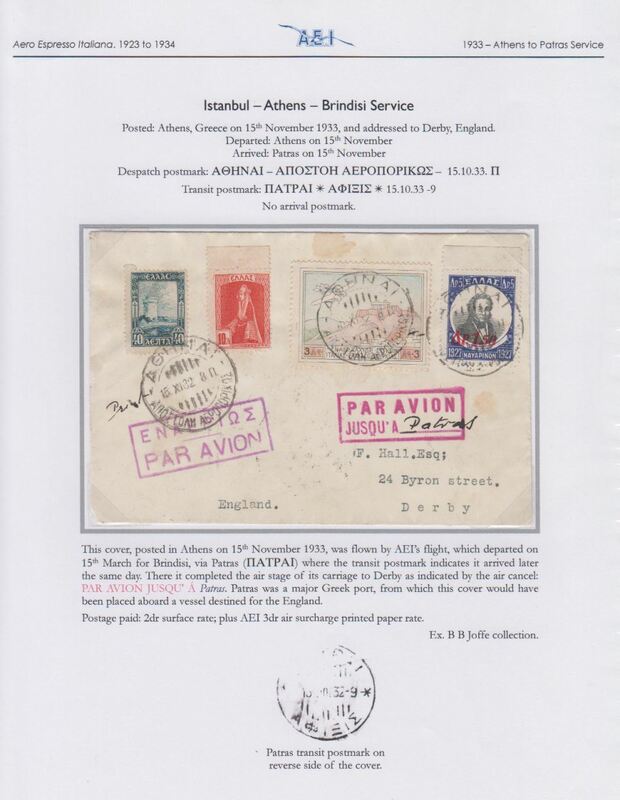 Athens to England via Patras 15/10 transit cds verso, and Brindisi, plain cover franked 2dr surface + AEI 3dr air surcharge printed paper rate, superb strike red framed 'Par Avion/JUSQU'A (ms) Patras' Jusqua hs, ms 'Printed'. Ex BB Joffe collection. 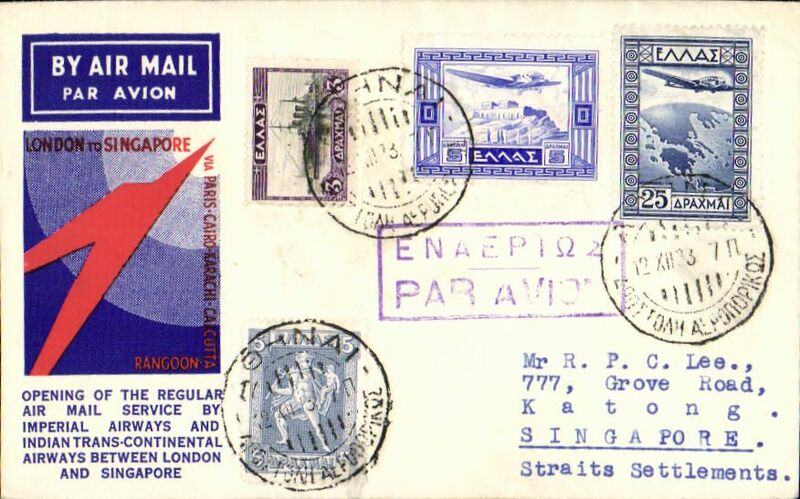 Imperial Airways/ITCA, F/F Athens to Singapore, no arrival ds (see Goddard p85), red/white/blue 'Speedbird' souvenir cover franked 38d, canc Athens cds, violet framed Greek/English 'Par Avion' hs. Only 50 flown. 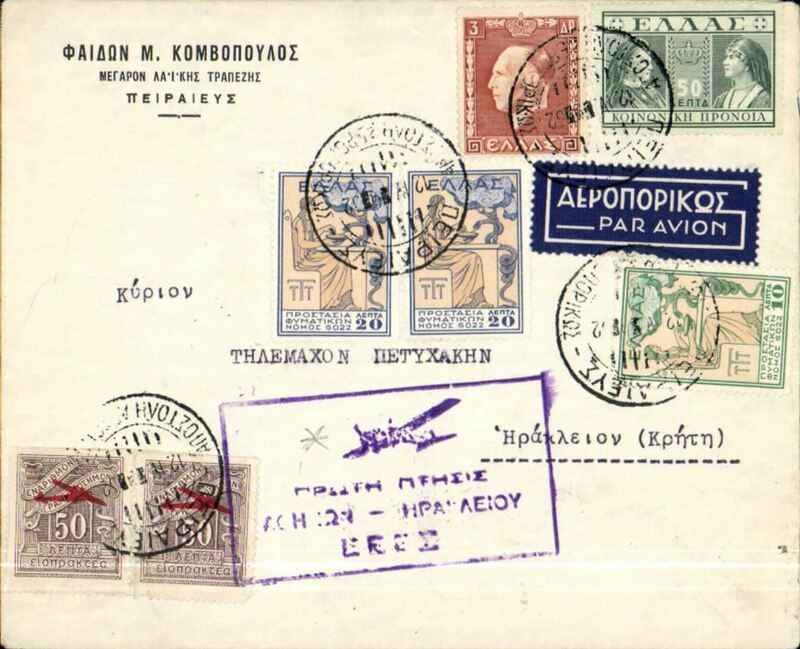 Hellenic Aerial Communications/Ala Littoria inaugural Athens-Salonica-Tirana-Rome-Malta service, F/F Greece to Malta, bs Valleta 10/3, plain Drossos cover franked 1932 2d/5d, 1933 Govt 2d, 5d airs, canc Athens Aerodrome dr cds, black two line "First Airmail/Athens-Valetta (Malta)" flight cachet, violet boxed Athens airmail cachet and dark blue Athens airmail etiquette. Nice item. 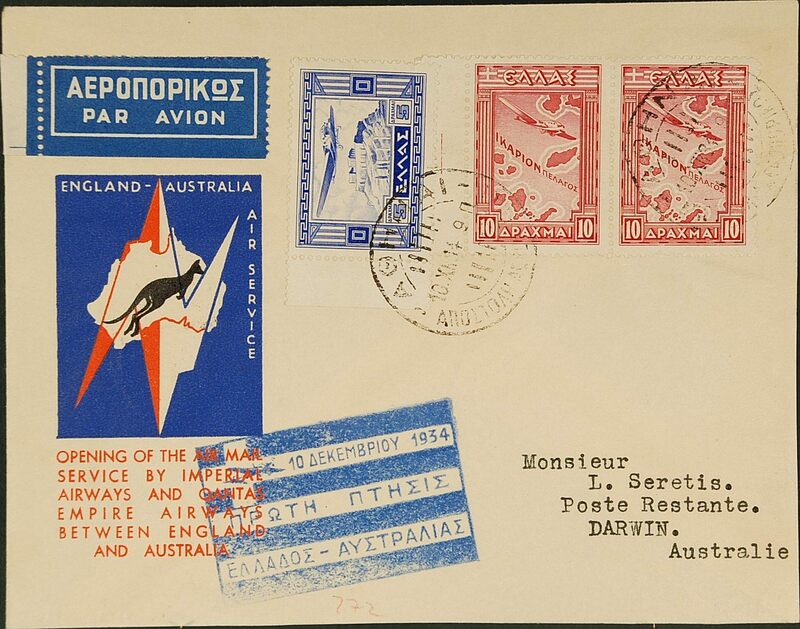 Imperial Airways, Athens to Darwin, bs 19/12, carried on F/F London-Singapore extension to Australia, red/white/blue kangaroo official souvenir cover, franked 1933 Air Government issue 10d x2 (cat Sg £23 used) and 5d, 1927 2d verso, all canc Athens cds, fine strike official blue/white Greece-Australia flight cachet. Nice item. 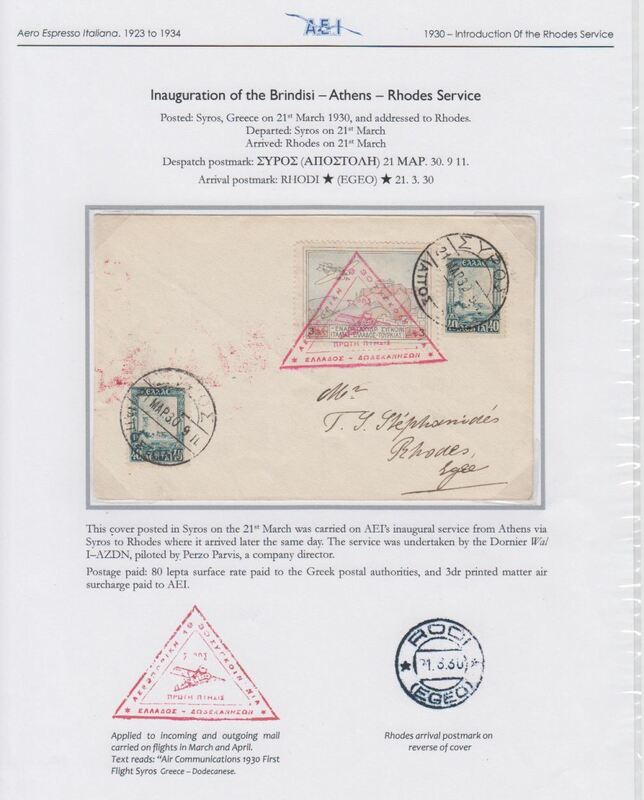 Air France, F/F Corfu to Tripoli, bs 20/4, Drossos cover franked 7D60, ms "Premier Vol/orfu-Tripoli", blue/white airmail etiquette. 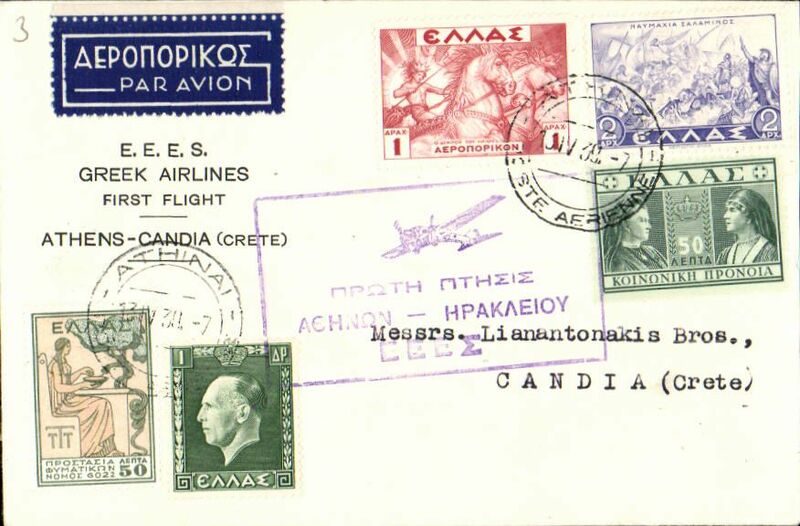 Greece to Yugoslavia, censored and registered (label) airmail etiquette cover, Athens to , bs Belgrade Airport, and Jevrejska 25/11, sealed Greek B&W currency control strip tied by black circular censor mark, dark blue/white airmail etiquettes front and verso. Ironed vertical crease. 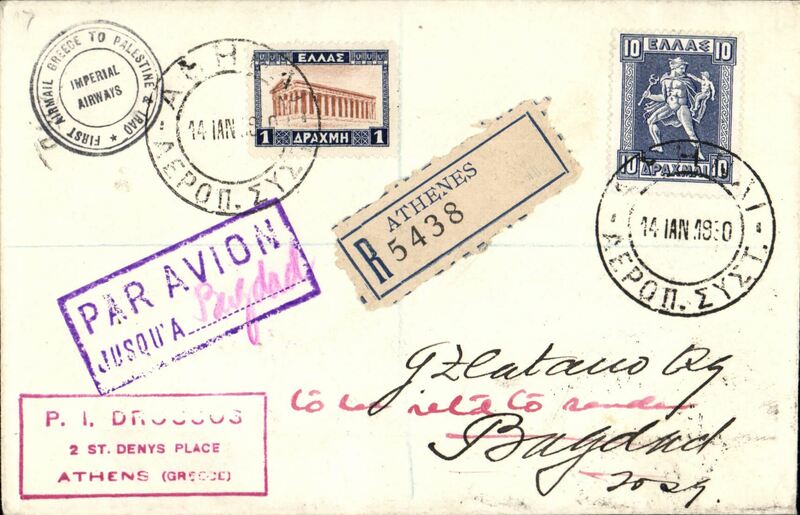 Athens to England, black 3 May 37 registered oval arrival ds on front, reg (label) cover franked 190d inc 1935 Mythology 30d,50d and 100d, canc Athens cds and registered Athens cds verso, dark blue/white airmail etiquette, black currency mark. 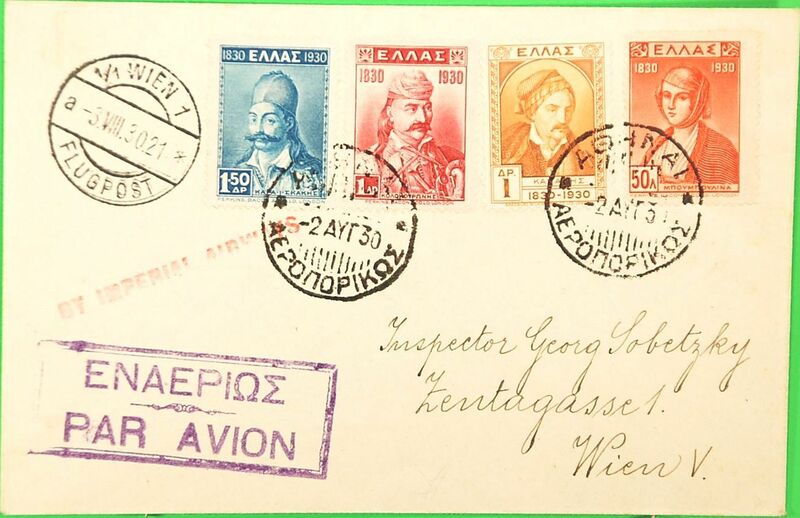 Hellenic Aerial Communications Company, F/F Athens to Heraklion, Crete, bs 13/4, multiple franking totalling 5d, purple boxed special flight cachet on face, black '3' in diamond verso. F/F Athens to Crete, printed souvenir cover franked 5D, violet boxed cachet, bs 13/4, Societie Hellenique de Communications Aeriennes (Greek AL). 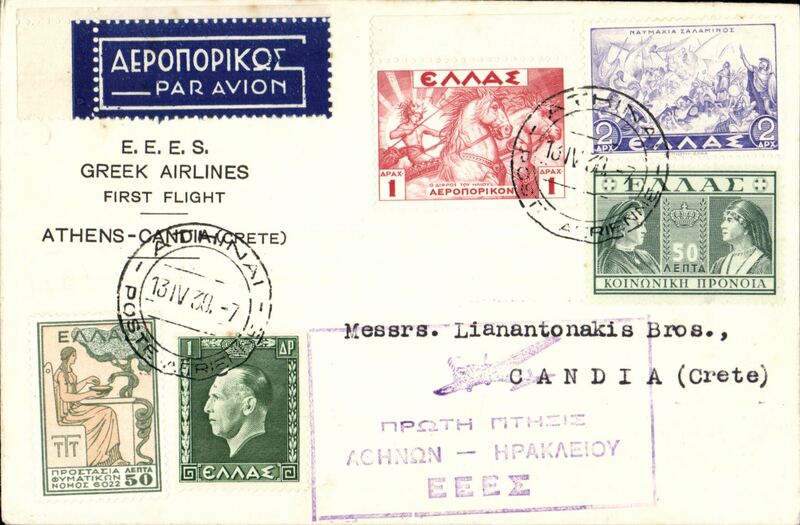 F/F Athens to Candia (Crete), printed 'EESS Greek Airlines First Flight cover franked 5D, violet boxed flight cachet, b/s, Societie Hellenique de Communications Aeriennes (Greek AL). 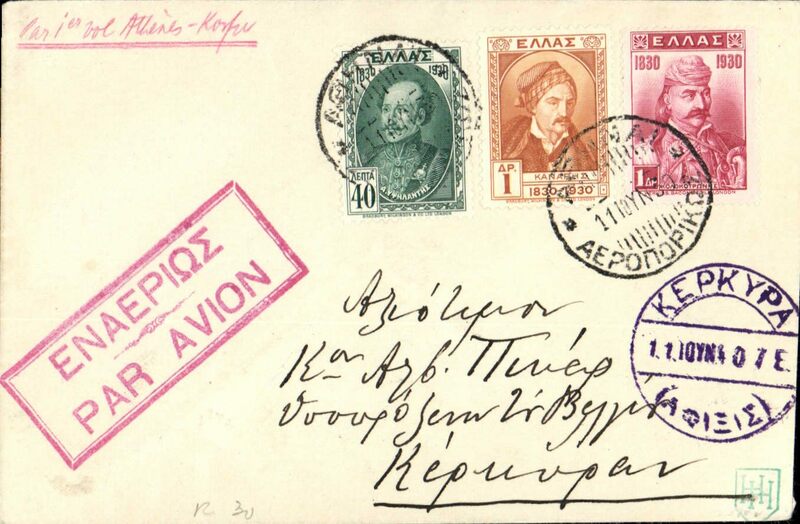 Hellenic Aerial Communications Company, F/F Athens to Heraklion, bs 13/4, airmail etiquette cover, large violet framed flight cachet. 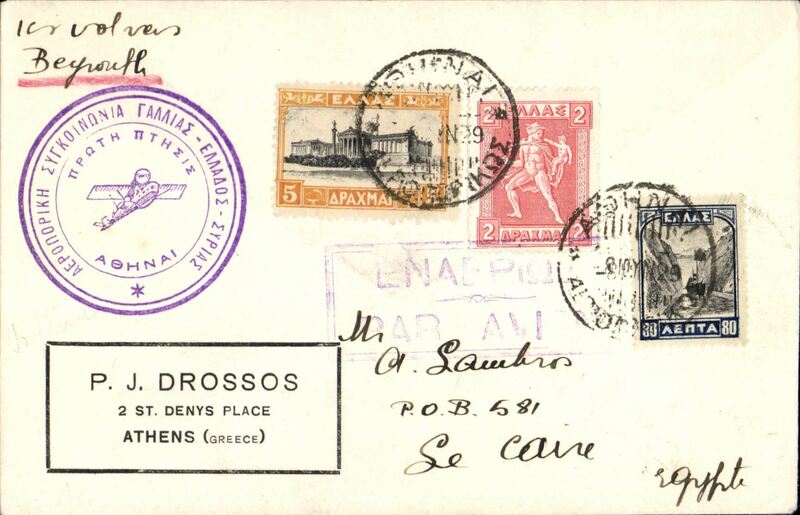 F/F Athens to Crete, printed souvenir cover franked 5D, violet boxed cachet, b/s, Societie Hellenique de Communications Aeriennes (Greek AL). 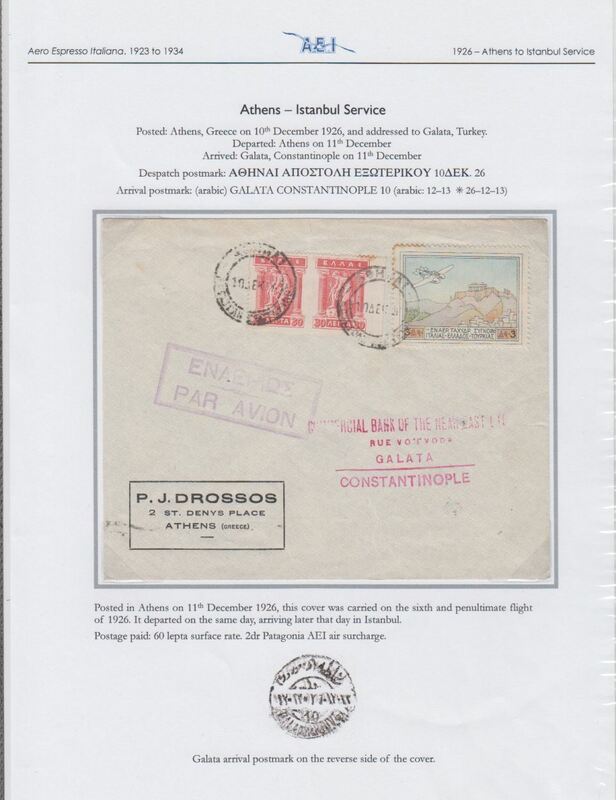 Hellenic Aerial Communications Company, F/F Athens to Heraklion, bs 13/4, airmail etiquette cover, large violet framed flight cachet. Image. 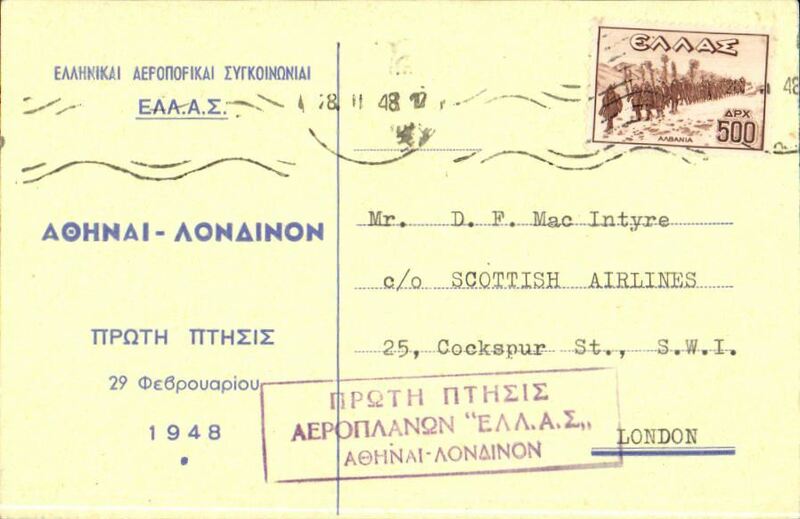 Scottish Airlines/Hellenic Airlines, F/F Liberator SX-DAA Athens to London, violet boxed three line flight cachet. Hellenic Airlines was a joint operation with Scottish Aviation, Ltd., which took a 40% stake in the company and the Greek state and armed forces jointly held 60% of the company. From its base in Prestwick, Scottish Aviation trained the Greek crews and maintained the company's fleet. Hellenic Airlines operated twice-weekly services from Glasgow/Prestwick to Athens via London, Paris and Rome using their B-24 Liberator. Olympic Airways, F/F Comet 4 Athens to Nicosia, bs 19/5, attractive blue/grey/white souvenir cover with image of Comet 4. Uncommon. Olympic Airways, F/F Comet 4 Athens to Beirut, bs 205, attractive blue/grey/white souvenir cover with image of Comet 4. Uncommon. Olympic Airways, F/F Comet 4 Athens to Tel Aviv, bs 19/5, attractive blue/grey/white souvenir cover with image of Comet 4. Uncommon. 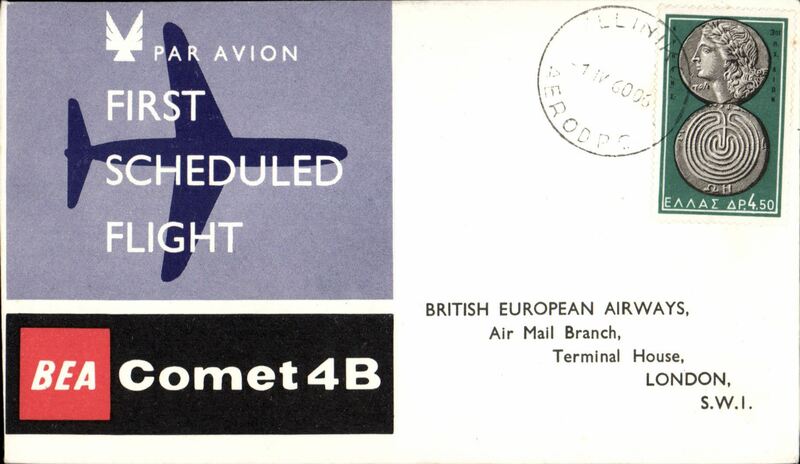 Olympic Airways, F/F Comet 4 Athens to London, attractive blue/grey/white souvenir cover with image of Comet 4. Uncommon. Olympic Airways, F/F Comet 4 Athens to Cairo, bs 21/5, attractive blue/grey/white souvenir cover with image of Comet 4. Uncommon. 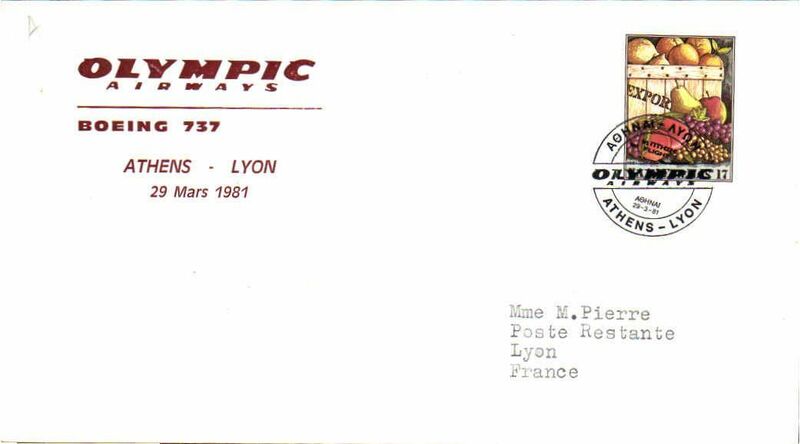 Olympic Airways, F/F Comet 4 Athens to Rome, bs 18/5, attractive blue/grey/white souvenir cover with image of Comet 4. Uncommon. 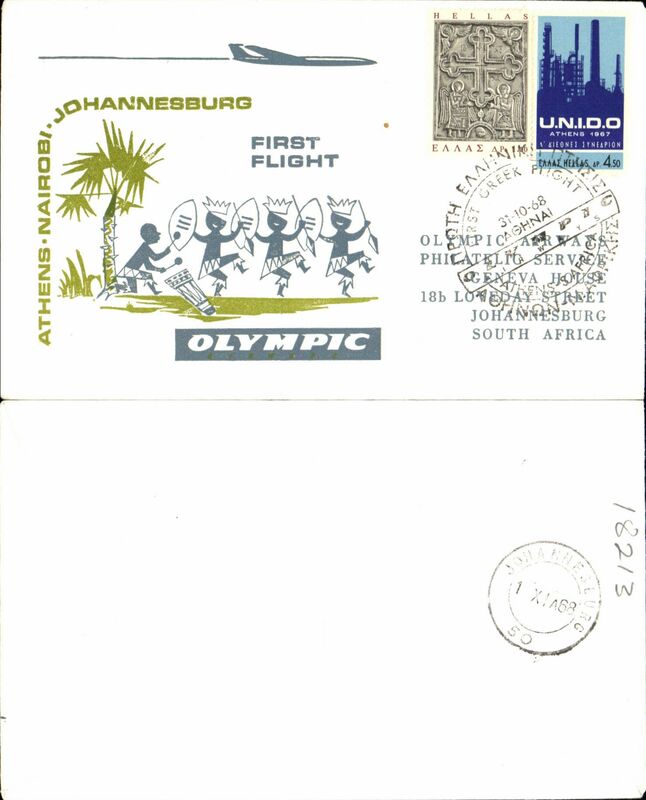 Olympic Airways, F/F Athens-Johannesberg, b/s, souvenir company cover. 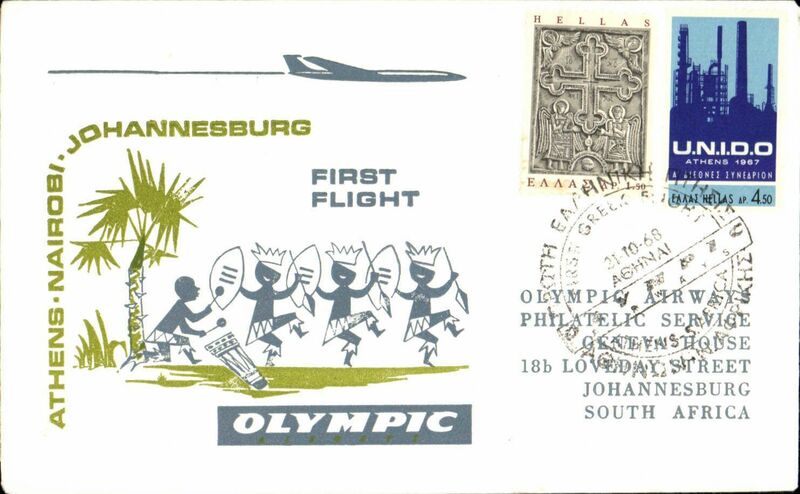 Olympic Airways, F/F Athens-Johannesburg, b/s, souvenir company cover. Only 4 covers carried, F/F Athens to Prague, bs 2/4/72, leg of the SAS DC9 F/F Beirut-Copenhagen, dark blue/grey company cover, 10x21cm, franked 1D50 x3, canc Athens Airport cds, typed "For First Direct and Non Stop Flight of SAS/Between Athens and Prague by SK834 2.4.72". The Athens-Prague sector is a genuine First Flight as flown before by SAS or ESAS. See #1539, and illustration of almost identical cover, in First Flight Covers Of SAS Scandinavian Airlines 1951-1984, Hanns Proksch 1985. 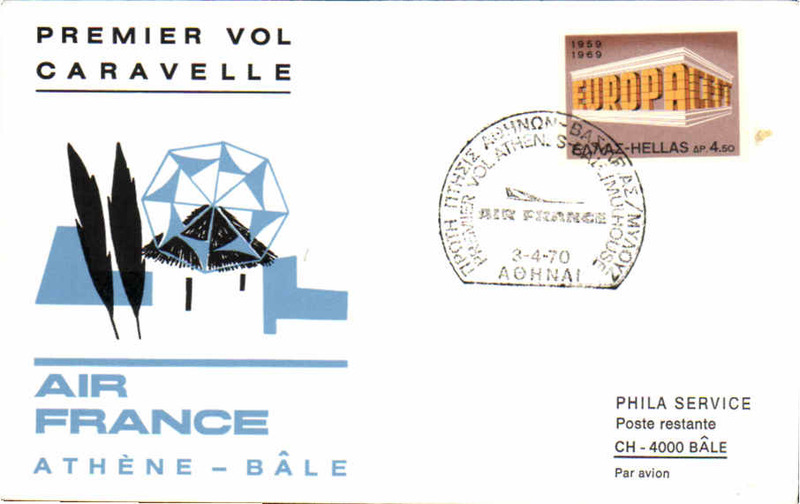 Only 4 covers carried, valued 2000Dm by Proksch in 1985. Superb item in pristine condition. first B737, Athens to Lyon, b/s, special depart cachet, Air France.